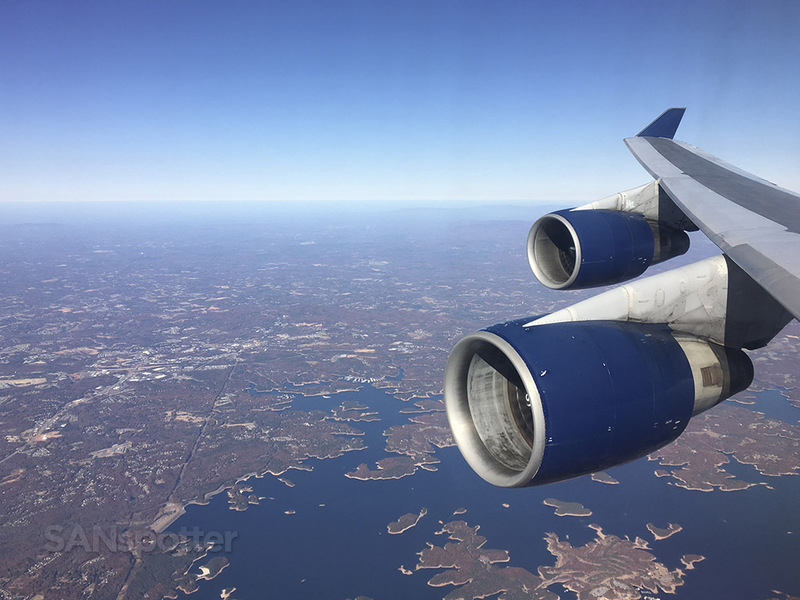 It’s always a pretty big gamble booking flights based on aircraft type alone, especially when it comes to airlines with massively diverse fleets and dynamic schedules such as Delta. 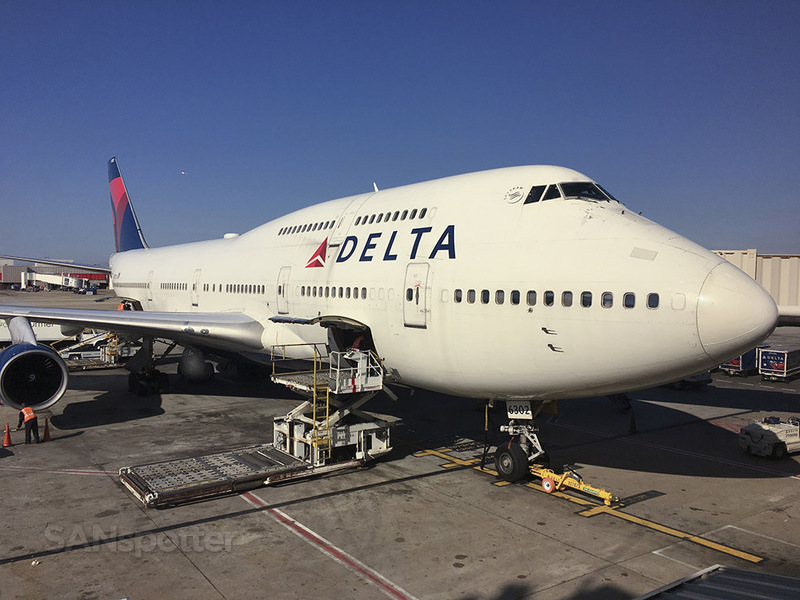 This entire trip was built around the 747 and it would have been a pretty big disaster if Delta had decided to change to a different aircraft at the last minute. 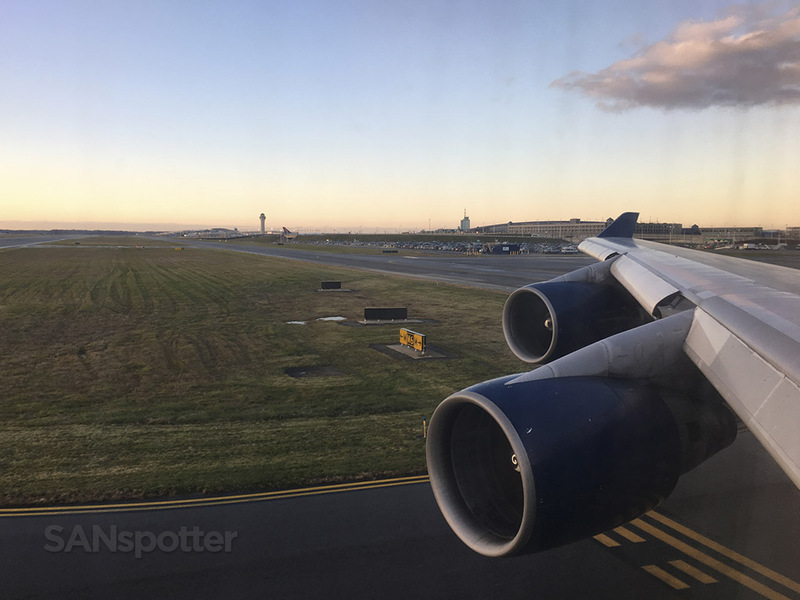 It shouldn’t come as any big surprise that I was a bit nervous as I was walking into the terminal that morning to kick off this special domestic 747 adventure across the country today. 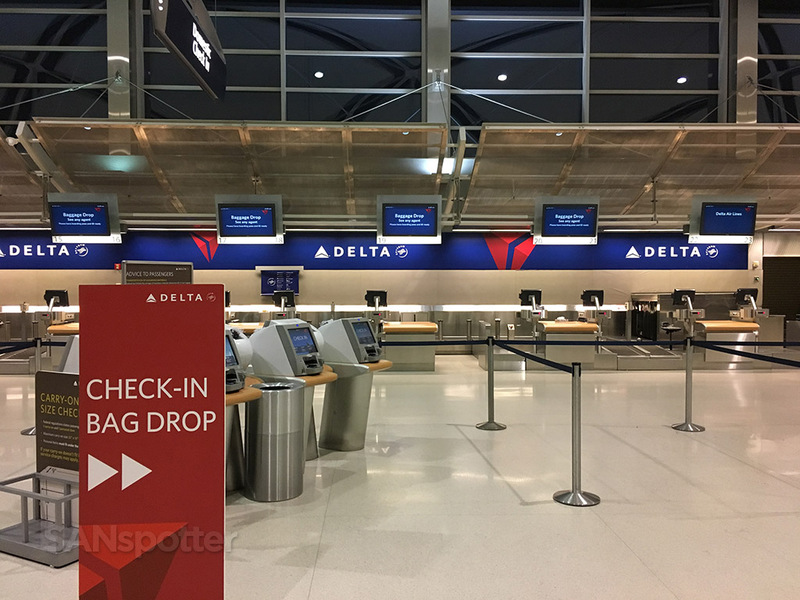 Delta Air Lines check in counters at DTW. 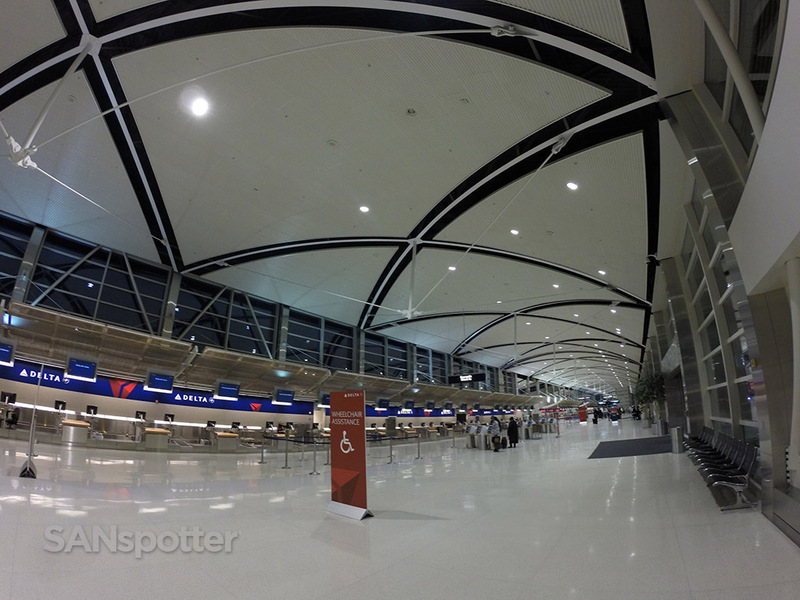 As you can see from this wide angle pic of the check in hall, I was one of the first ones here this morning. 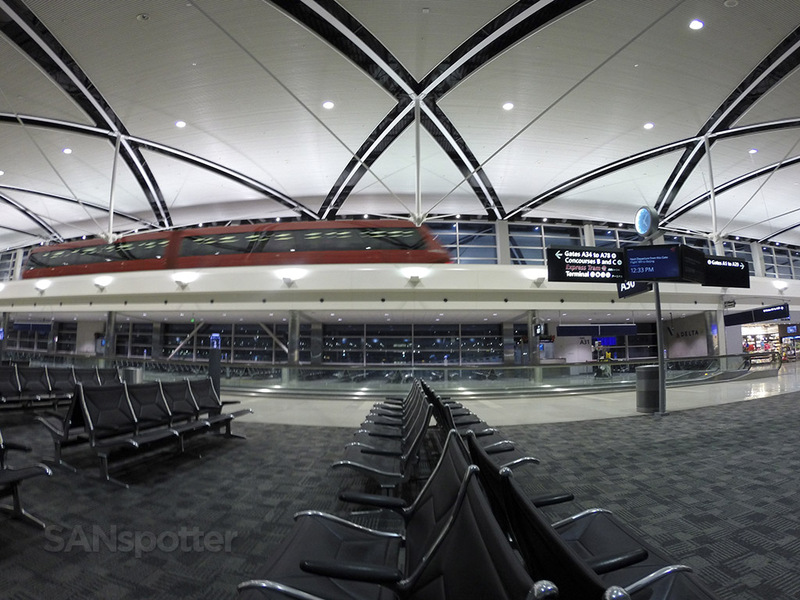 Being early and having the terminal to myself is never a bad thing – especially here at DTW watching that cool red tram run back and forth in silence. 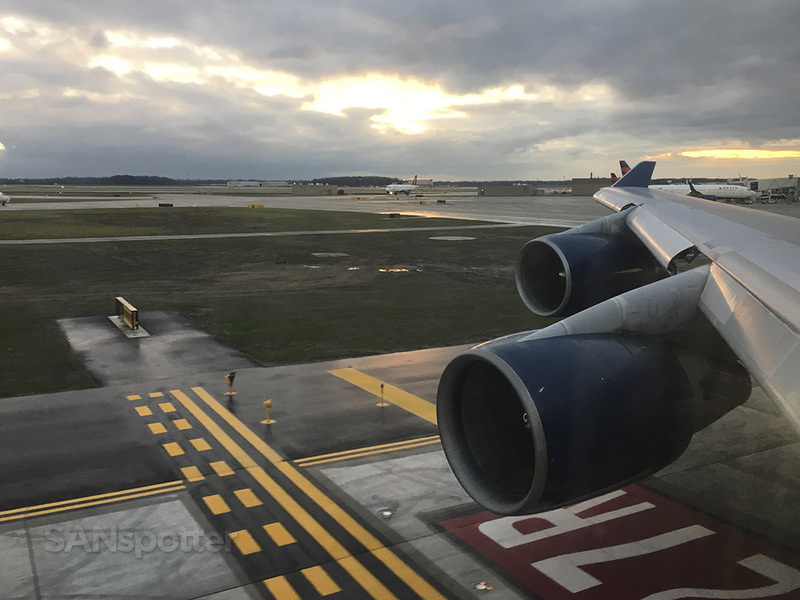 Luckily for me (and all the other passengers who wanted a ride on a domestic 747), Delta held true to their word and there was indeed a 747-400 waiting for us parked at gate A34 ready to take us to Atlanta. 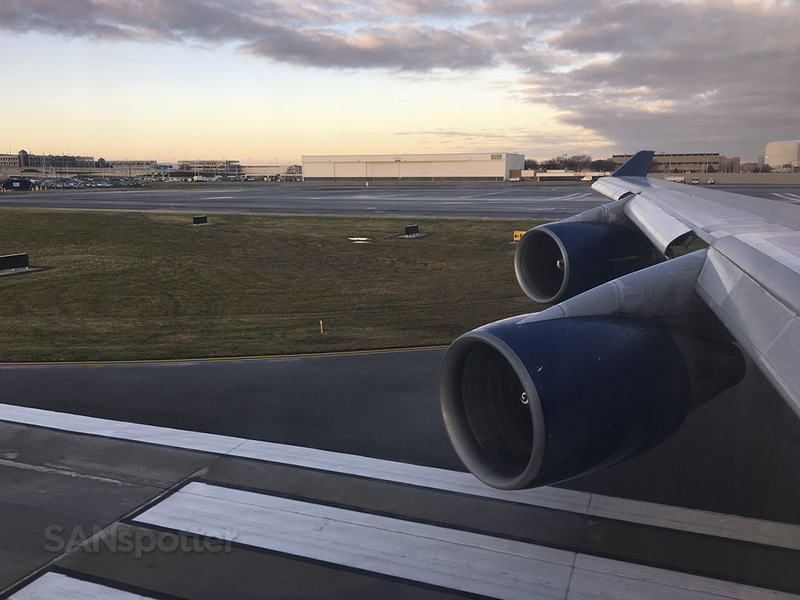 The whole situation felt really strange actually, mostly considering that we live in a time where small narrow bodies do the bulk of domestic US flying and it was difficult to wrap my head around the concept of a 747 flying a short domestic segment such as this. 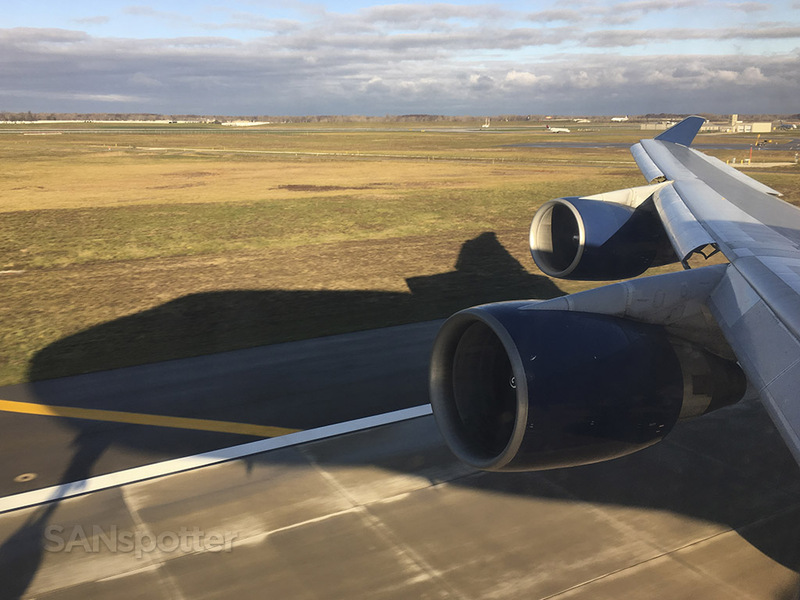 Big airplanes on short routes were a lot more common back in the 70’s and early 80’s, and I almost felt nostalgic enough about it all to show up wearing bell-bottoms and a wide-collared shirt to celebrate the occasion. Almost. Seat map of this Delta Air Lines 747-400 (courtesy of seatguru.com) showing my seat for this flight. There she is. N662US waiting patiently for us at gate A34. 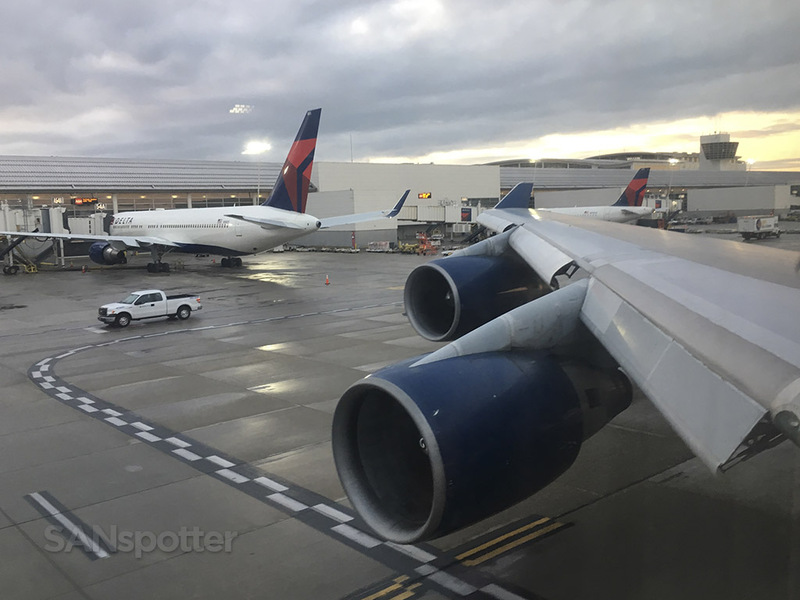 Interestingly enough, I flew on this aircraft once before – it was with Northwest Airlines on July 9th, 2003 and the route was DTW-NRT. Hello again old friend! 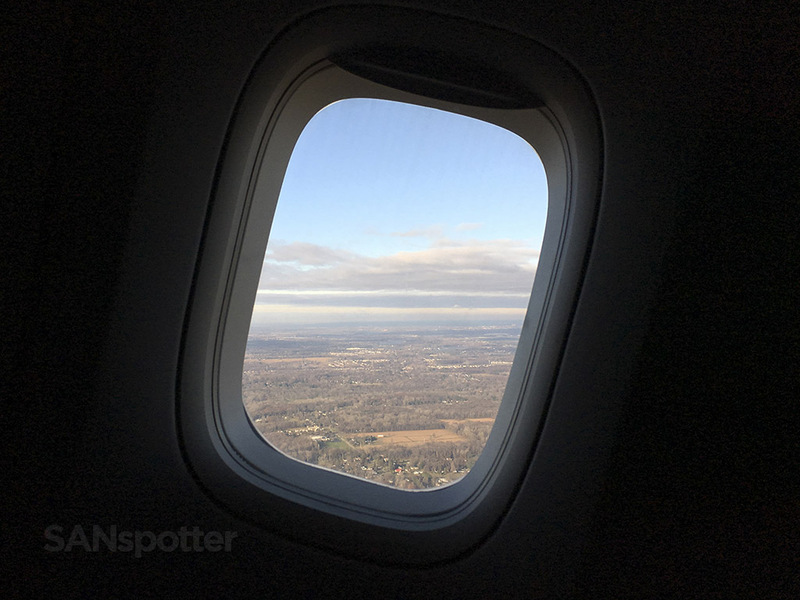 It’s not easy to get decent pics through the dot-pattern tint on the windows here at DTW, but I tried my best. Do I look excited about this or what? 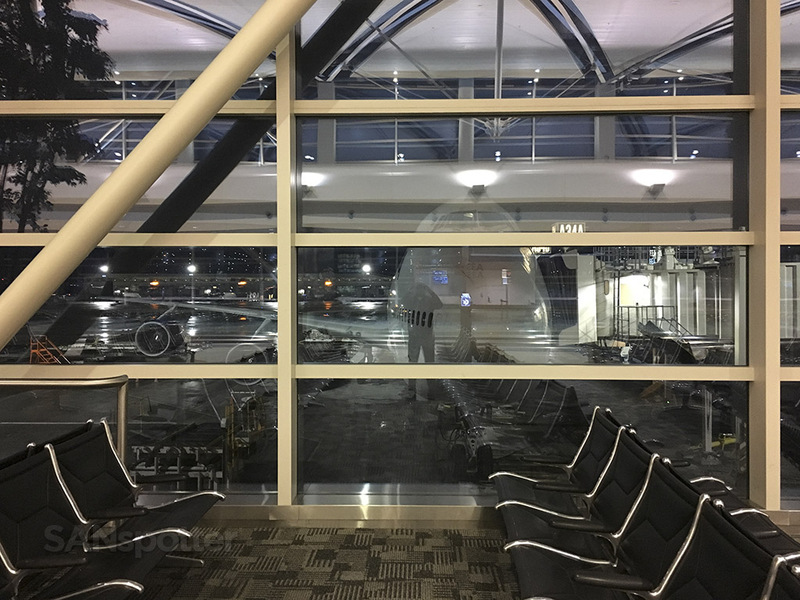 Yes, I got here way too early, but there was no way I was missing this flight! 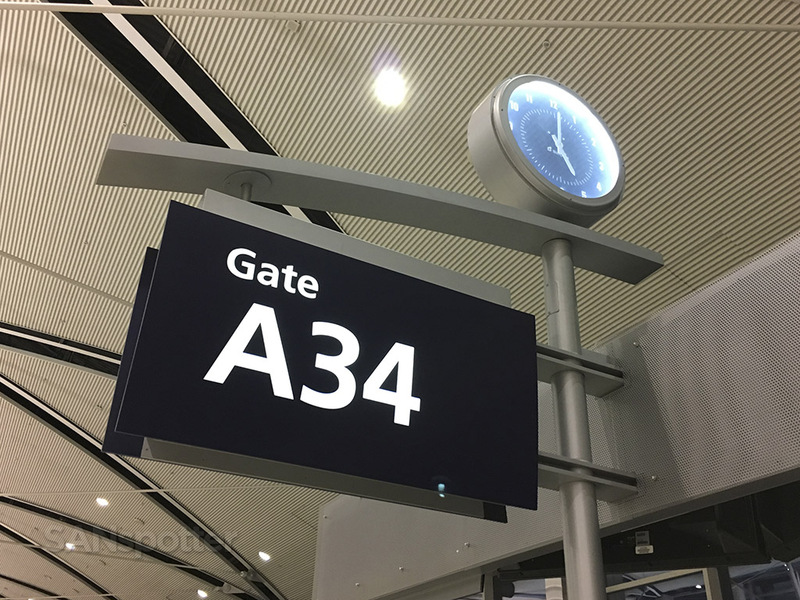 Gate A34 is where the action is this morning. Yes, it says 5:02am on the display. I wasn’t kidding when I said I got here early! It’s not very often I take special flights such as this, so I didn’t quite know what to expect as other passengers arrived at the gate. Would it be a party atmosphere? 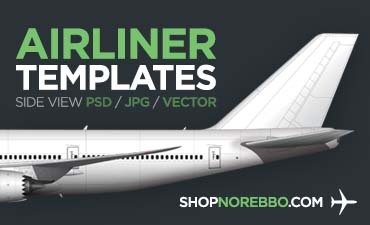 Would nobody even notice (or care) that it was a 747? It ended up leaning more to the “nobody cares” side of things as we waited to board – there were a few people taking pics through the windows just before boarding, but otherwise it was business as usual and the mood no different as if we were all about to board a regional jet to Fort Wayne. Not much happening here at gate A34 in the moments leading up to boarding. Alright, here we go. About to board my shortest 747 segment ever! 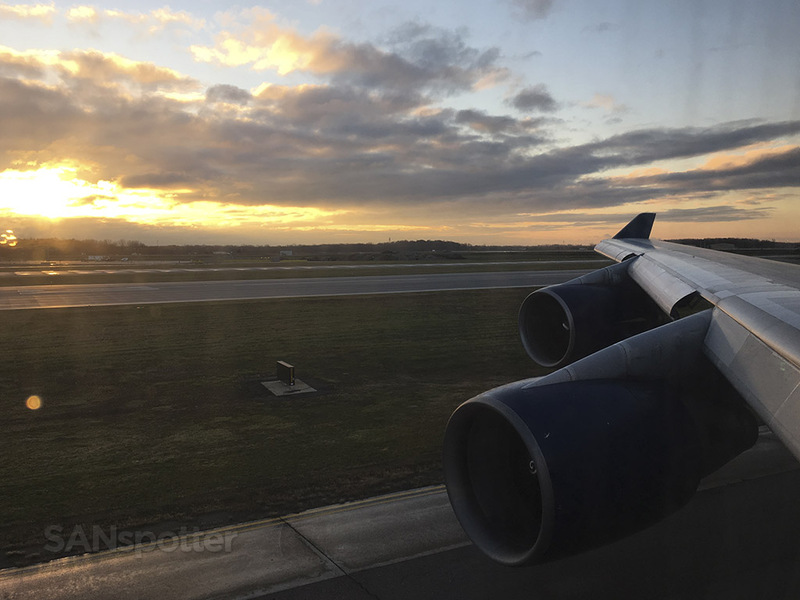 Things got a bit more festive as soon as they let the Delta One passengers onboard, as there were many who stopped in the jet bridge to take a pic of the nose of the 747 through the window. 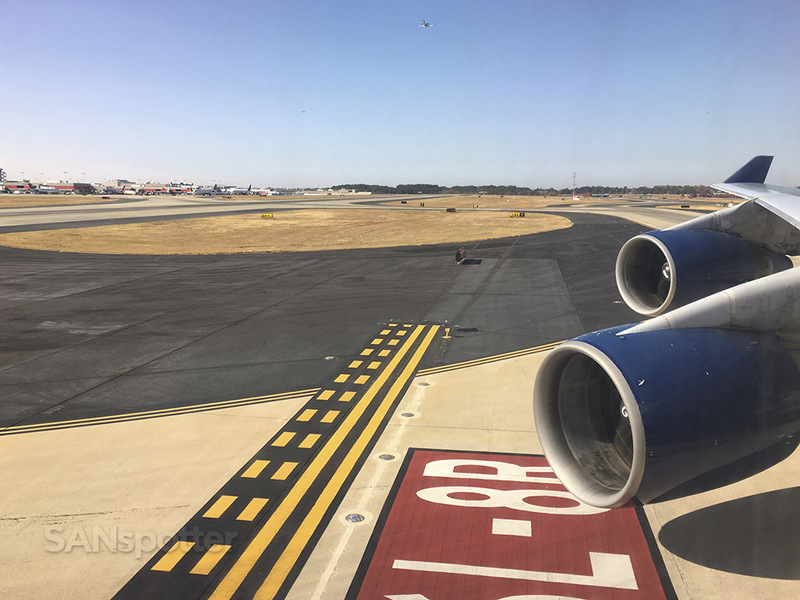 Even one of the Delta ground staff walked by saying that she wished that she could fly on the 747 today, so at least there were some people who knew that this was a special treat. 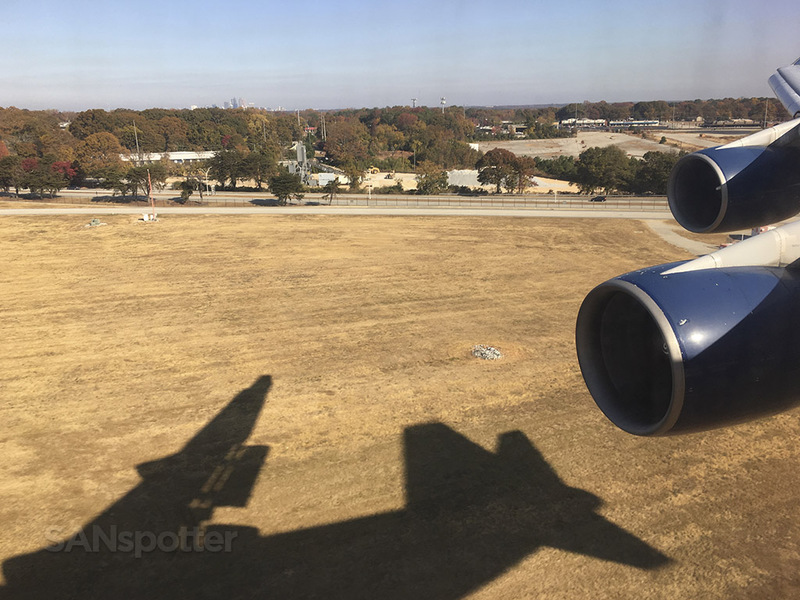 It was at this point that I didn’t feel like a total airline nerd, because hey – it was clear that I wasn’t the only one excited about this flight! I had to elbow my way in at the windows to get this pic of the old gal just after my boarding pass was scanned. 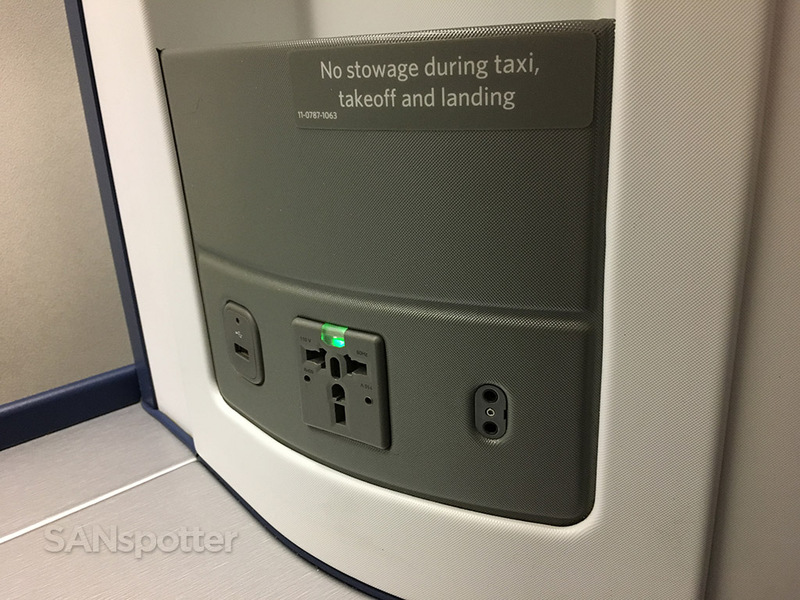 Many other passengers were trying to do the same thing! 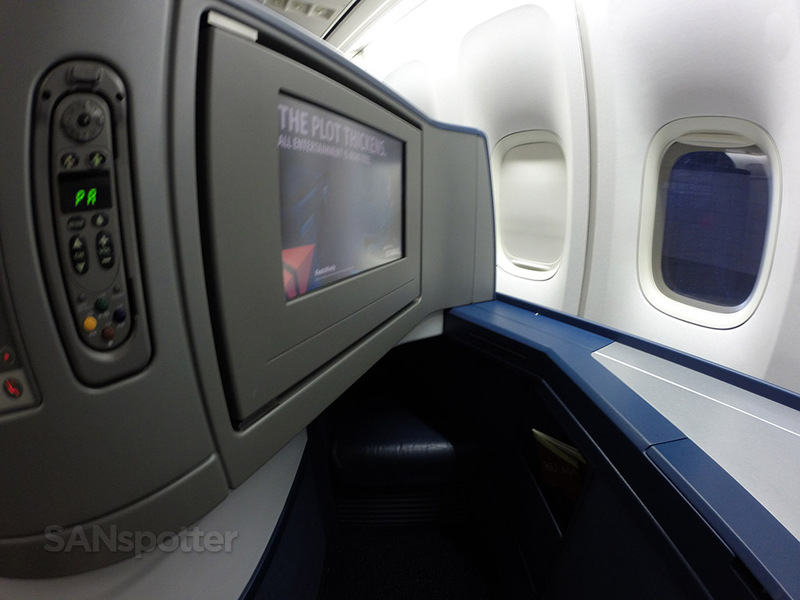 Delta One passengers boarded through the forward boarding door, while premium economy and economy boarded through the second. 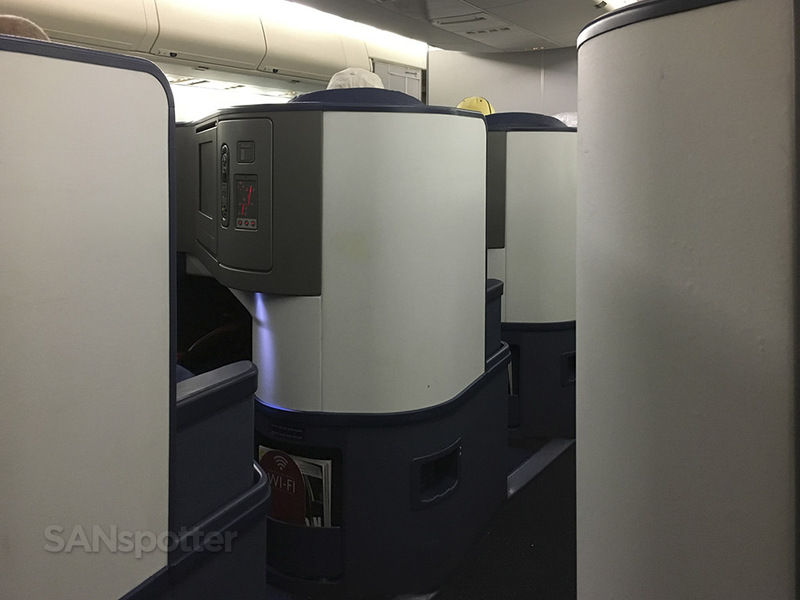 This was a completely full flight though, and they eventually started letting economy passengers board through the forward door (and walking through the Delta One cabin) to expedite the boarding process. 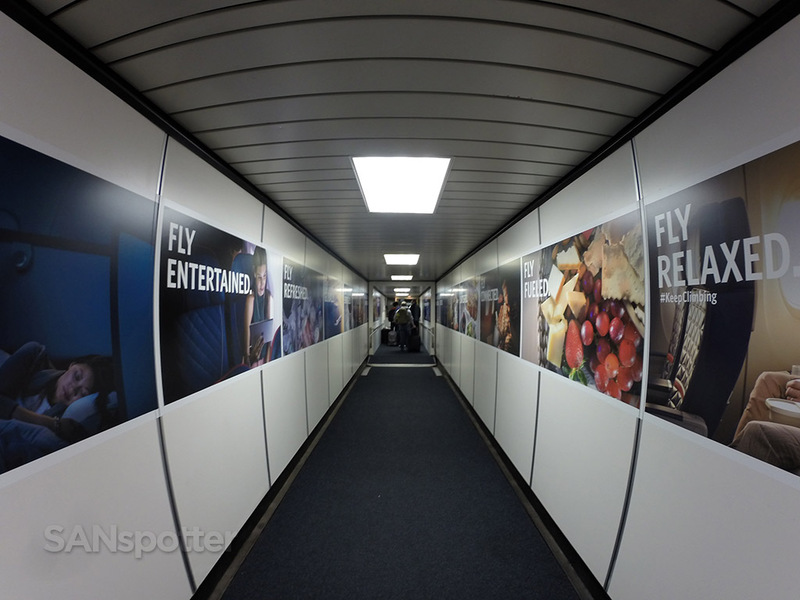 These Delta-branded jet bridges are starting to get familiar. Mental note: fly different airlines in 2017, Scott. 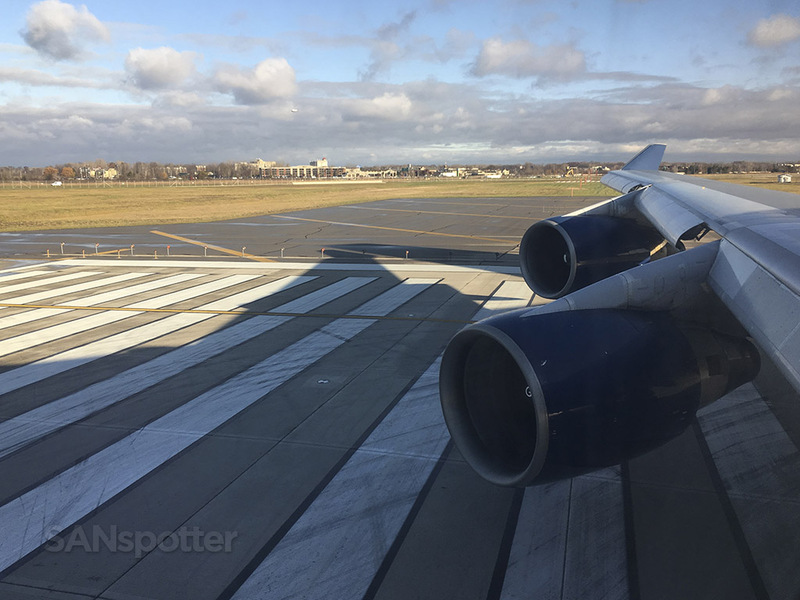 There’s nothing quite like the feeling of stepping onto a 747. 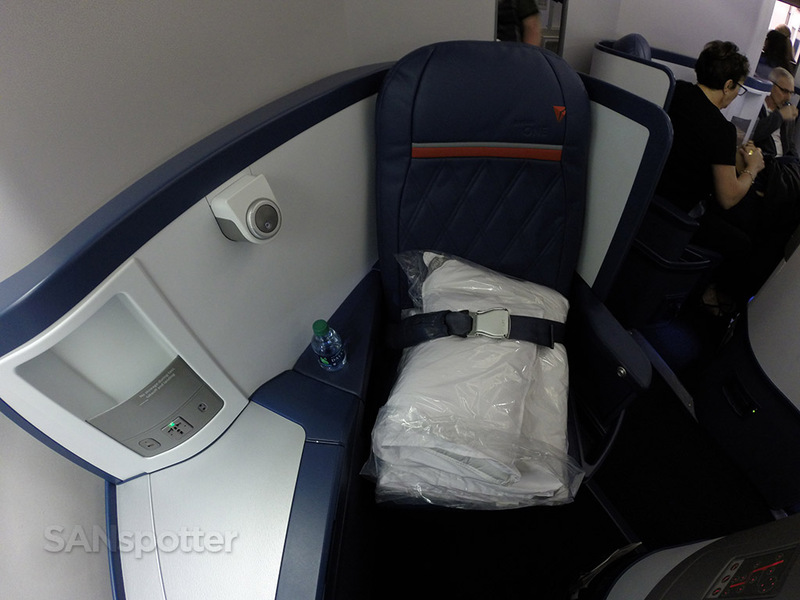 My only other experience with Delta One was on a 767-300 from JFK to LAX late last year, and right away I was surprised to find that the seat design and layout was significantly different. 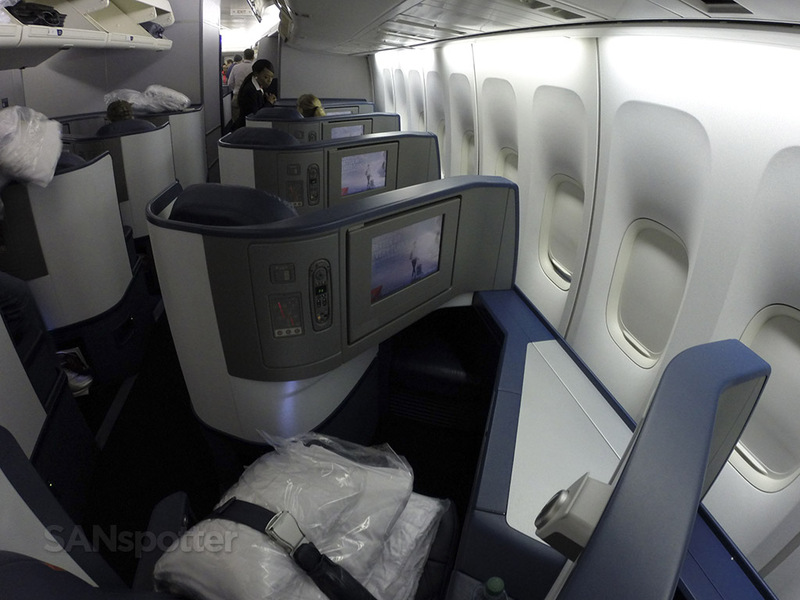 The 747 seats are much more private than what was on the 767, and I much preferred these. The way they angled towards the sidewall and windows did a lot to increase the feeling of overall privacy. 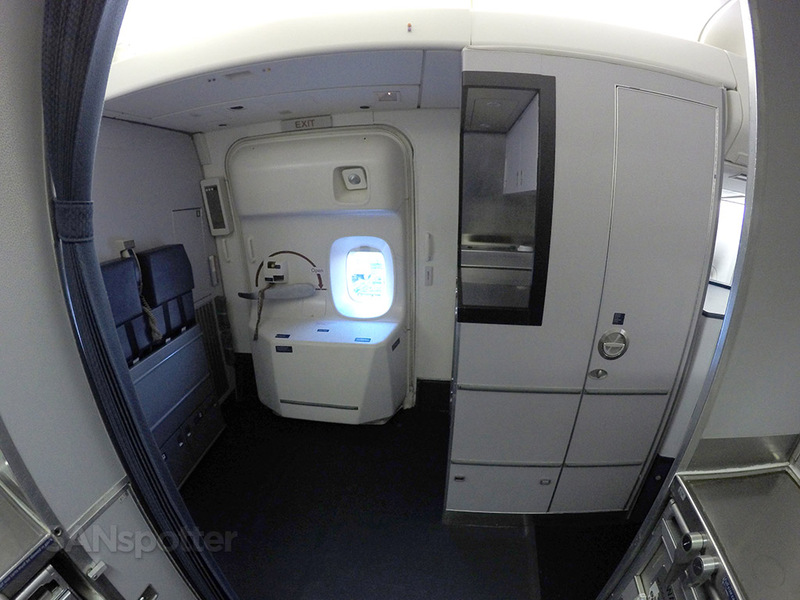 This layout is basically the opposite of what I recently experienced on my Virgin Atlantic A340-600 Upper Class flight from LHR to JFK, and I’m happy to report that there was none of the awkwardness. 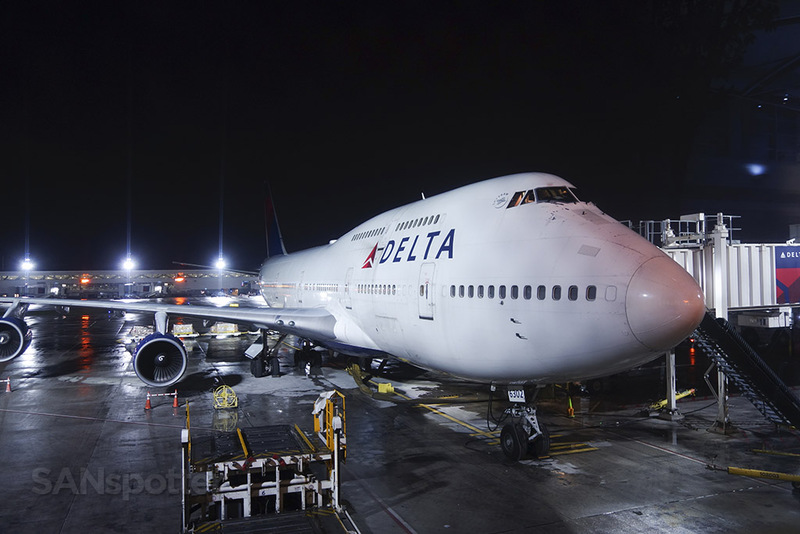 Delta Air Lines 747-400 Delta One seat 13K. Delta Air Lines 747-400 Delta One cabin. 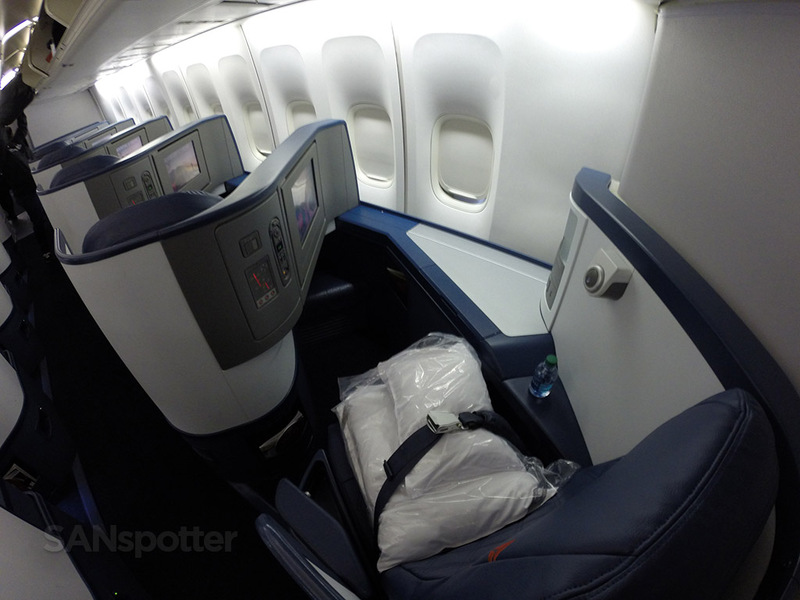 Full size duvet on the seat even for this short flight down to ATL. 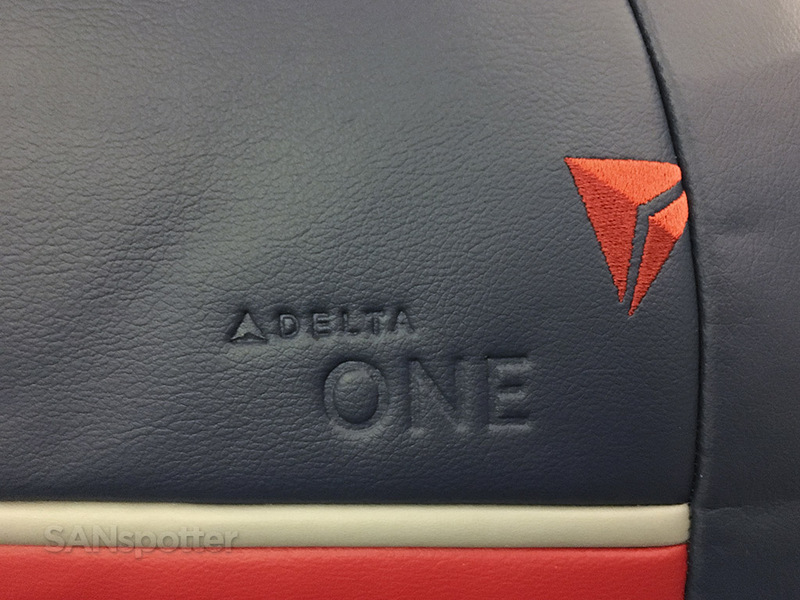 Delta One branding embroidered into the seat. 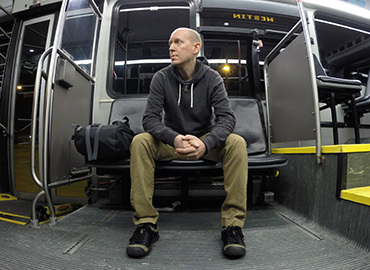 The seat configuration is a little weird at first (with the seat controls in your face) but overall it’s really comfortable and private. 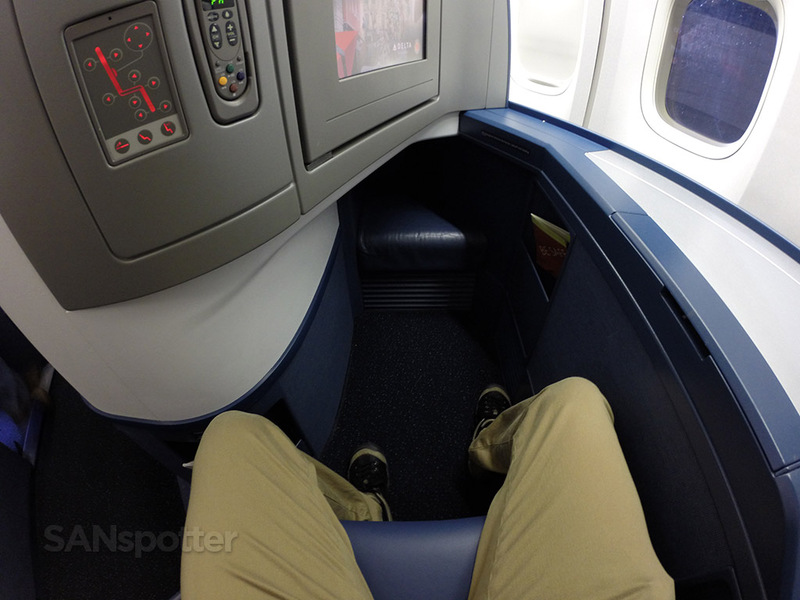 Plenty of leg room here, though the footwell is a bit narrow. Seat controls and tethered remote for the entertainment system. 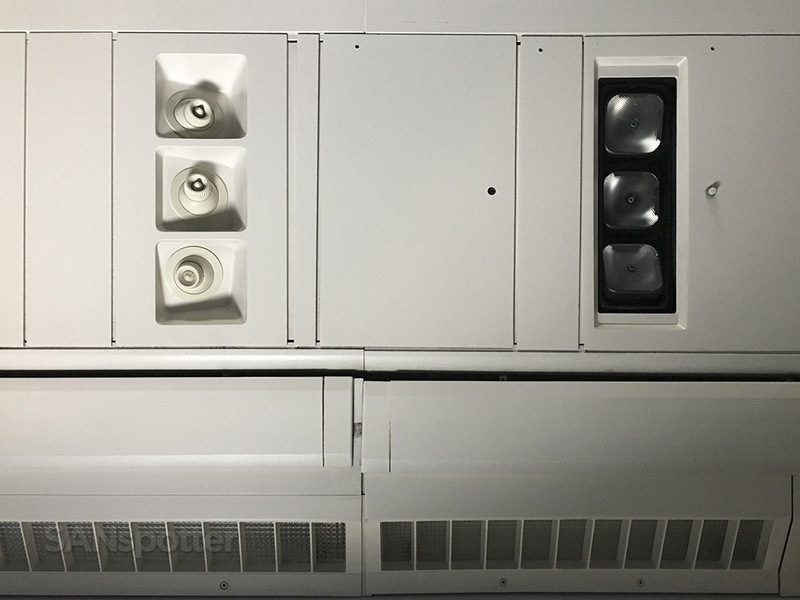 In-seat power and audio ports. 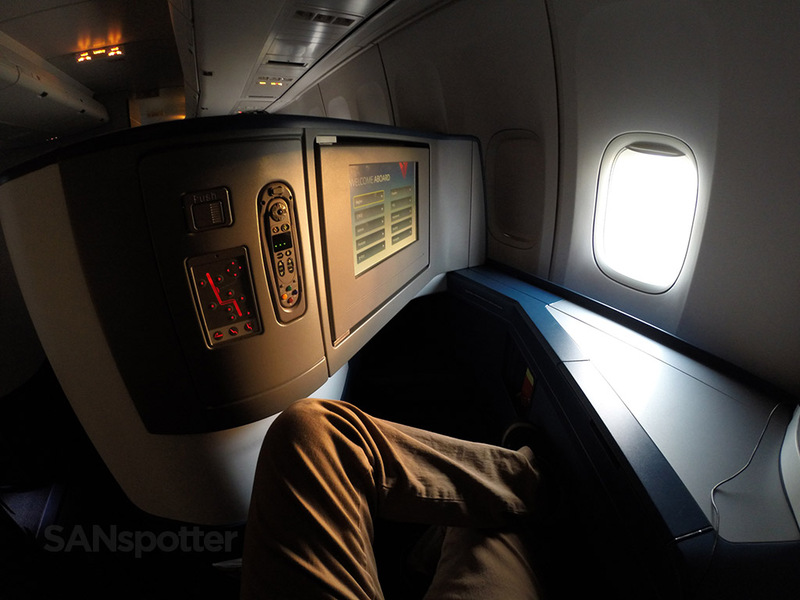 Reading light on the upper portion of the seat. 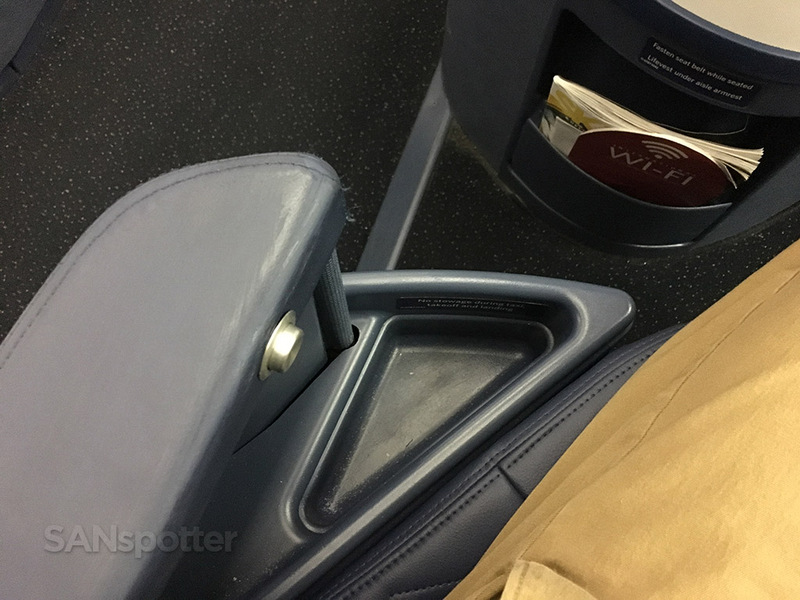 Retractable arm rest – with a convenient little storage nook. 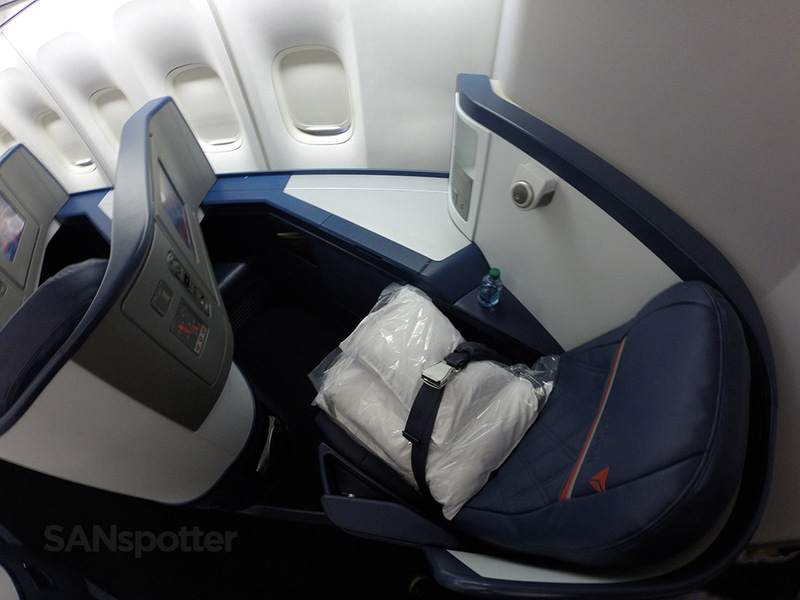 The privacy is quite good in these Delta One seats. 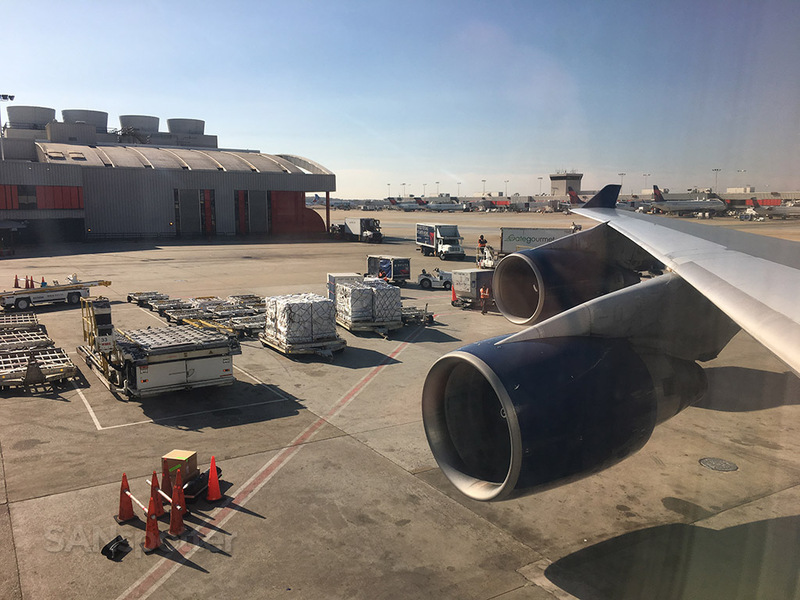 The boarding process seemed excessively long, and at first I brushed it off as a consequence of loading a very large aircraft. But the minutes were rolling past without any acknowledgment from the crew, and that’s never a good sign. 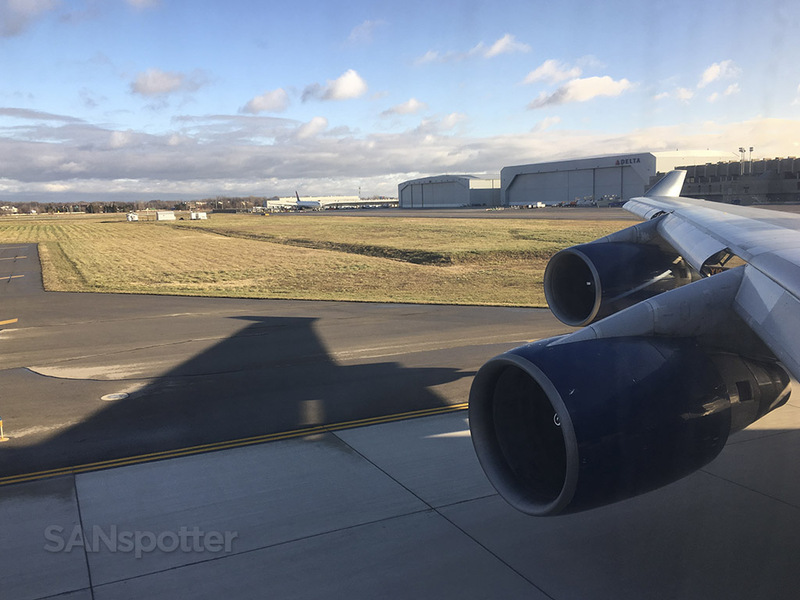 My suspicions of troubles were confirmed several minutes later when the captain came over the PA to let us know that there was a fuel loading issue – but it shouldn’t take long to resolve and we’d be on our way soon. 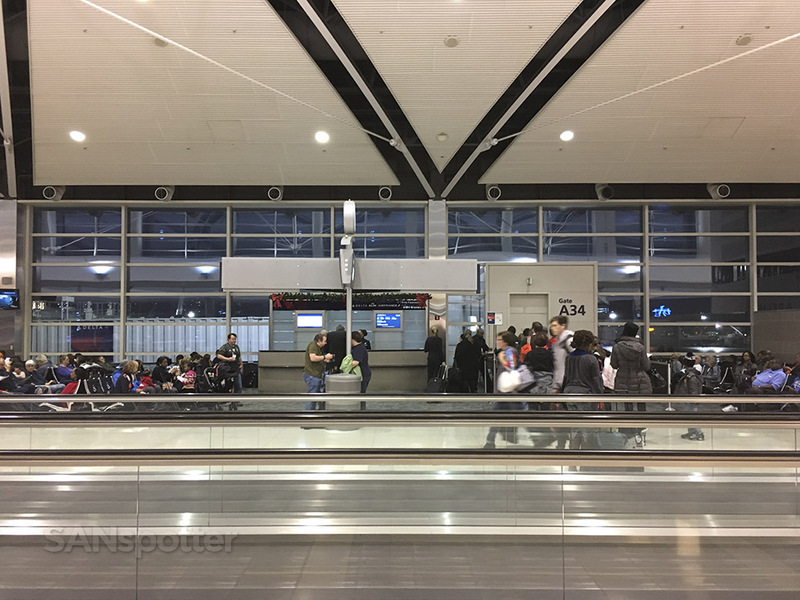 Not long after that announcement, he walked downstairs and personally greeted the Delta One cabin – which I thought was a very nice thing to do. 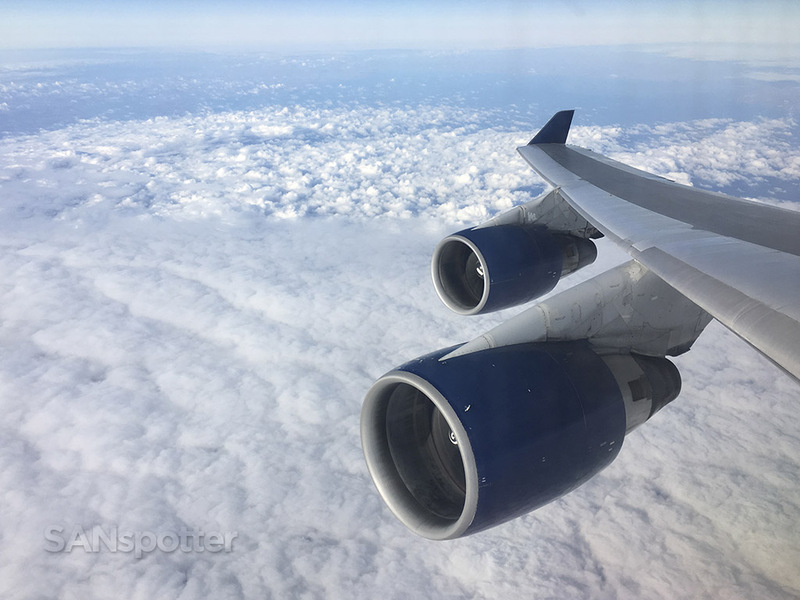 He even made a comment about flying the Queen of the Skies, stating that this was a special treat as she doesn’t normally do a lot of domestic flying. Time to have a look at the safety card! This is the front cover. 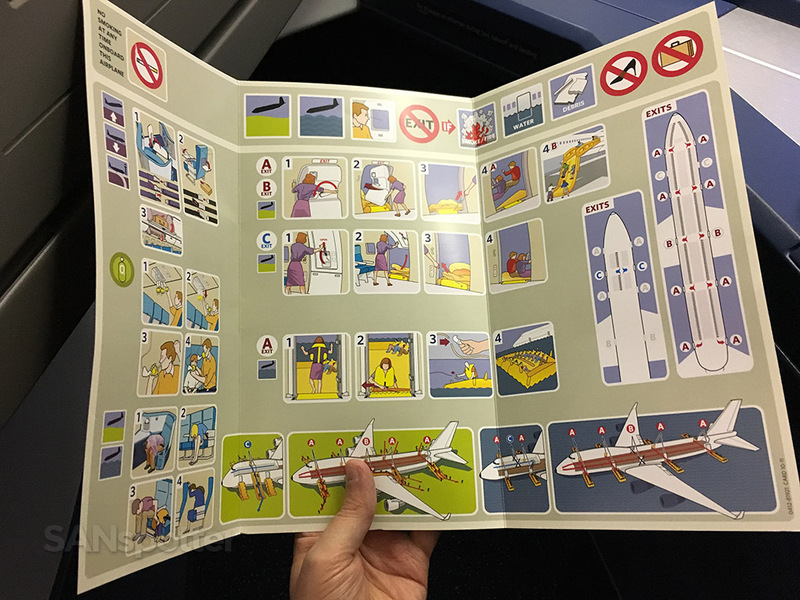 Delta Air Lines 747-400 safety card inner cover. 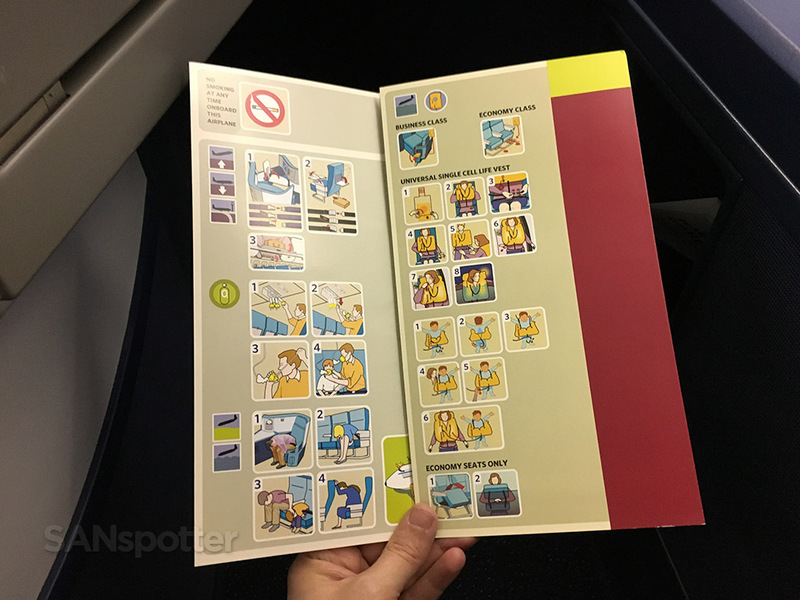 Delta Air Lines 747-400 safety card interior. 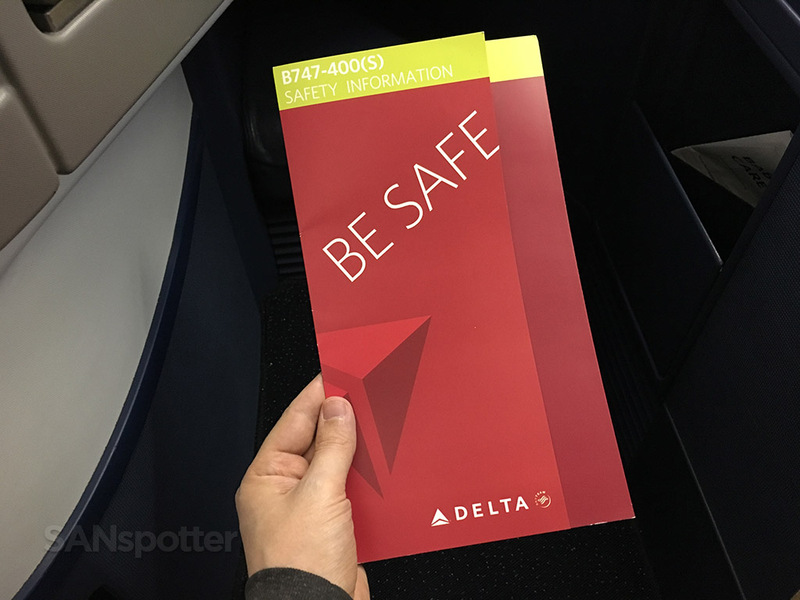 Delta Air Lines 747-400 safety card rear cover. 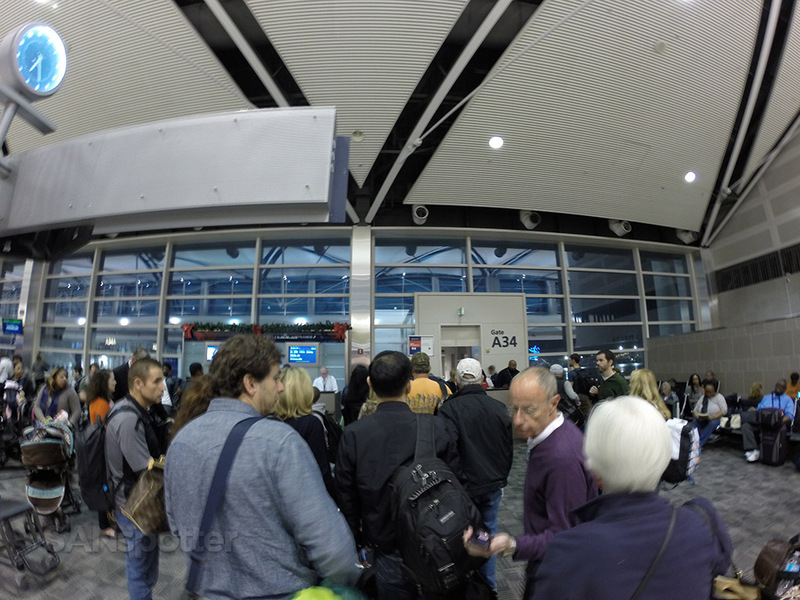 I assumed that we’d be on our way out of Detroit shortly after the captain’s greeting, but…more delays. 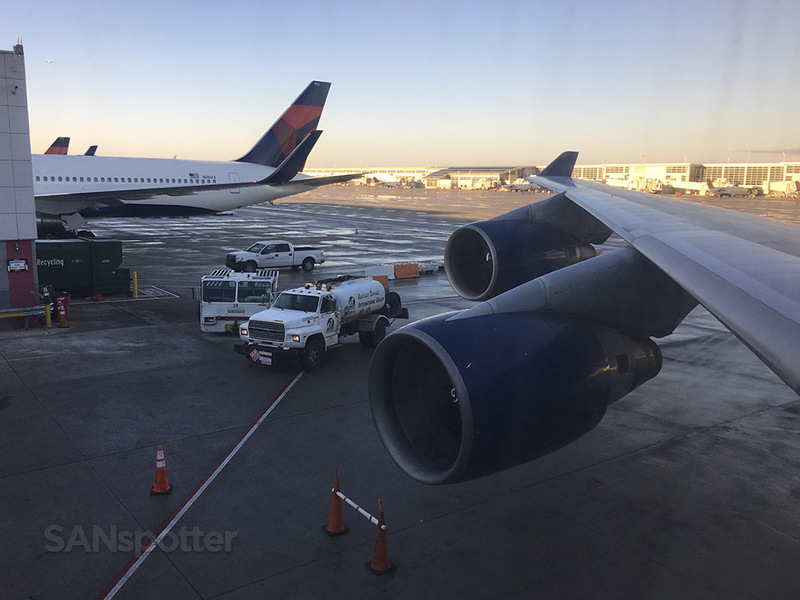 We sat at the gate for a while longer before pushing back, and even though I knew that this was the aircraft that would be continuing on to SEA from ATL later today (with me on it), I couldn’t help but worry that this delay could screw things up and it might force Delta to change things bit. 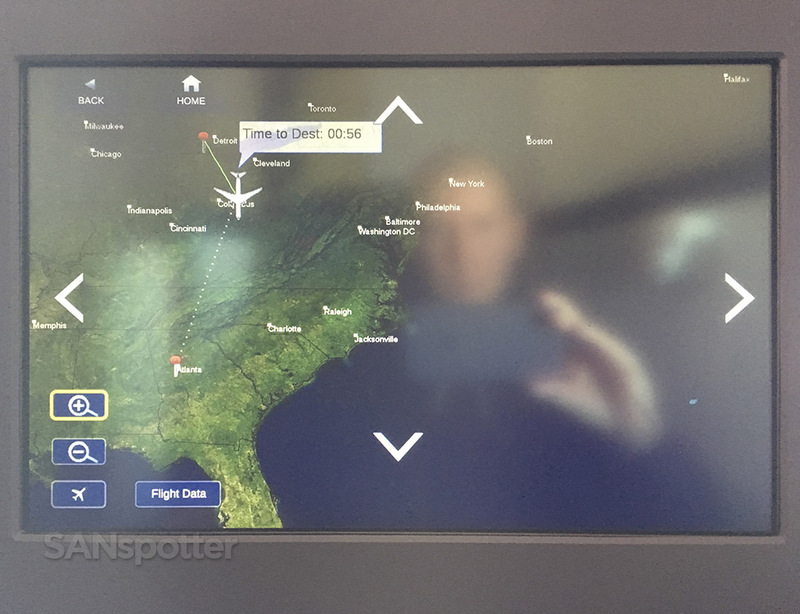 Even worse, what if I missed my Alaska Airlines connection to SAN at SEA later that evening? 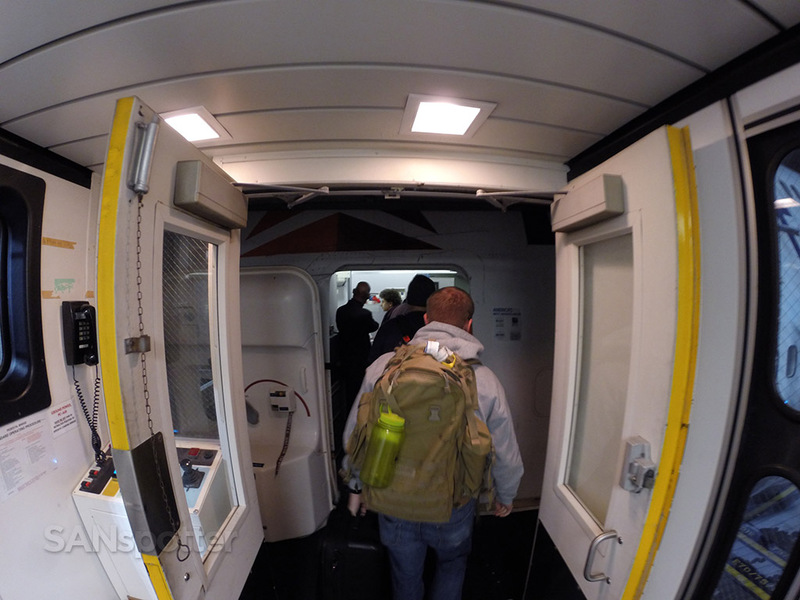 I tried to put it out of my mind as we slowly made our way out to the runway. 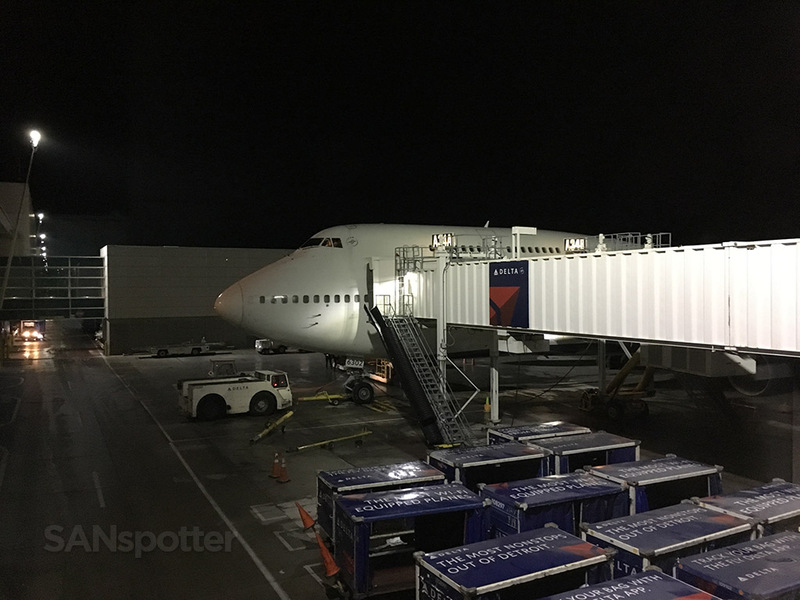 The Delta One cabin waiting patiently for pushback. Finally pushing off the gate! Cabin lights were turned off as soon as we started rolling. This is finally happening! 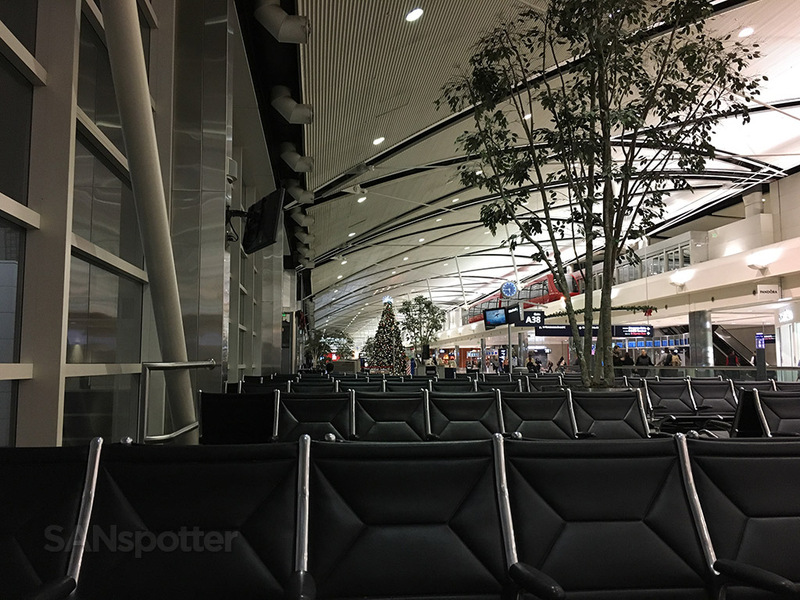 Taxi times at DTW are always long, but I didn’t really mind today. 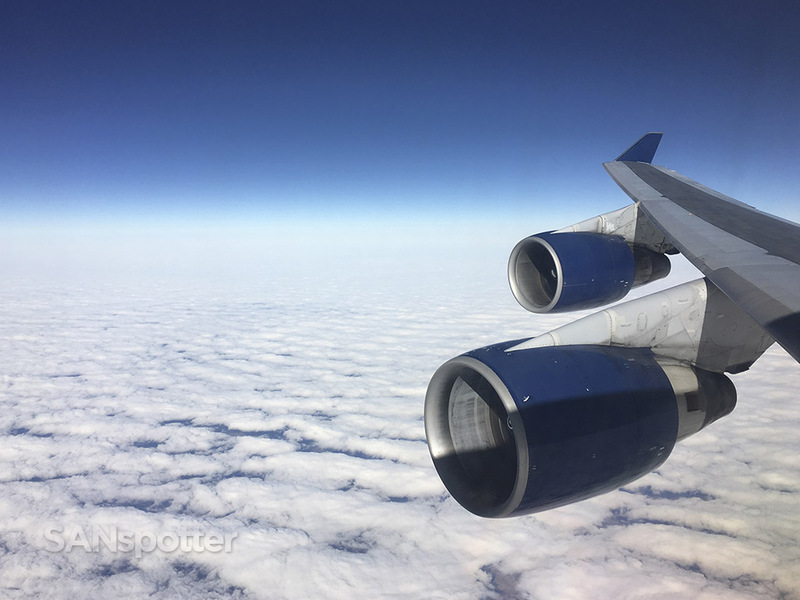 More time spent on the 747 is never a bad thing. The fact that the sun started poking through the clouds was the icing on the cake. 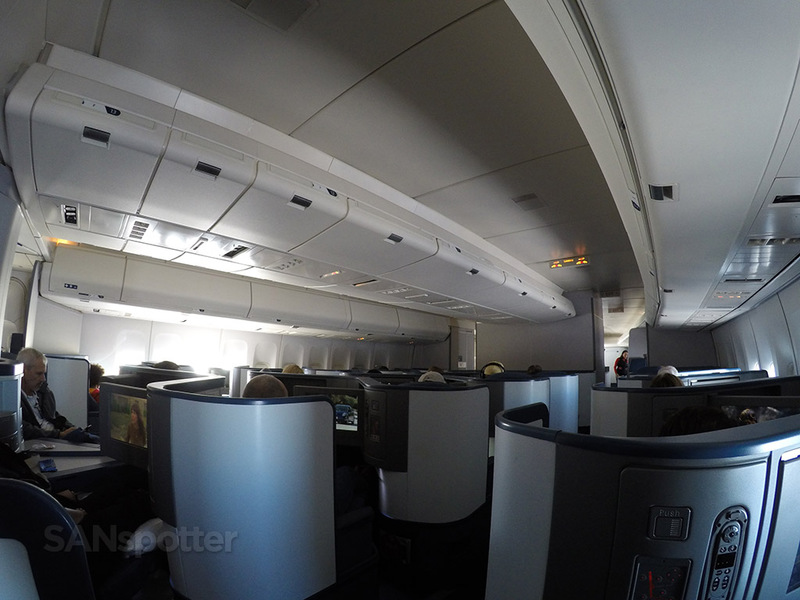 We eventually made it to the departure runway, but we ended up sitting for a while with no comment from the captain. Uh oh. More problems? We sat longer. And longer. 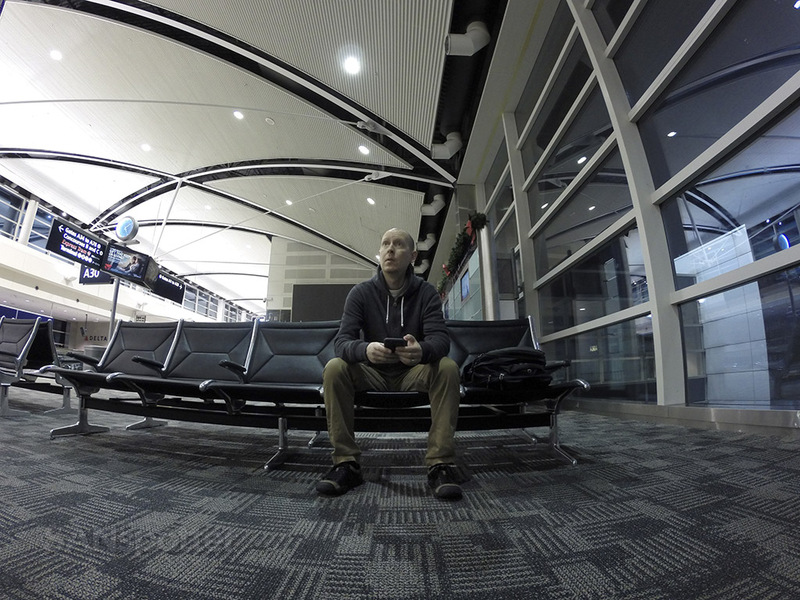 Waiting patiently for departure but…nothing is happening. 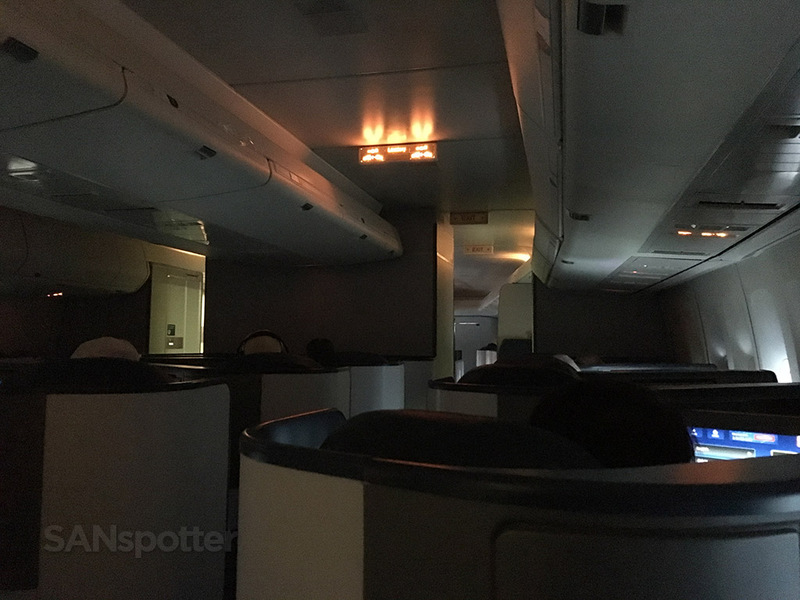 Finally a very perturbed sounding captain made an announcement over the PA saying that there was a fuel load issue that would require us going back to the gate. The proper amount of fuel was loaded, but it was balanced improperly and it needed to be fixed. He sounded really frustrated by it, calling it a “huge mistake” and he apologized profusely. Sigh. It was by now that I was praying that they wouldn’t cancel this flight altogether. Making the turn to head back to the gate. Right back where we started: gate A34. Nothing to do but try and catch up on sleep while waiting out the delay. After what seemed like an eternity back at the gate, we pushed back once again and I started getting excited about this flight. Again. However, our troubles were not over. 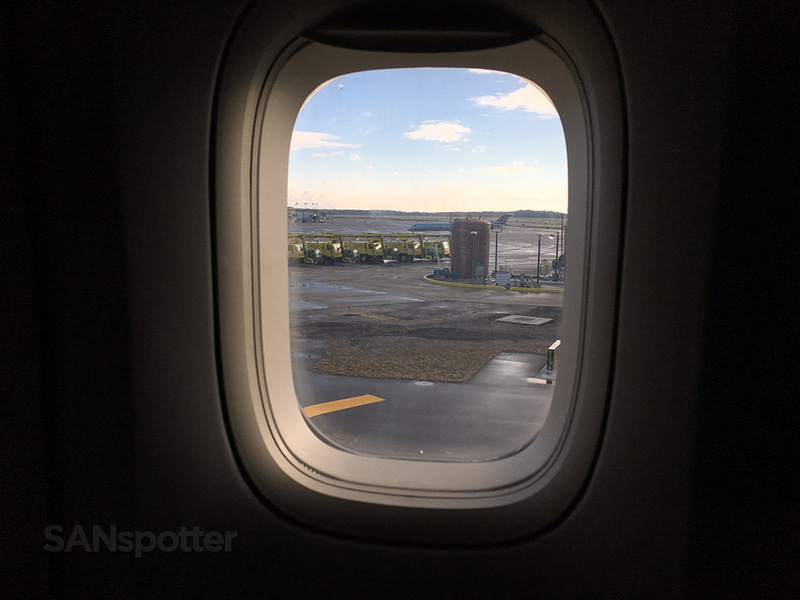 Several minutes into the taxi out to the runway, we stopped for an uncomfortable amount of time, and I was once again feeling like we were screwed. The longer we sat, the more I knew we were in trouble. Now what’s the problem? It didn’t take long before we were stopped again. 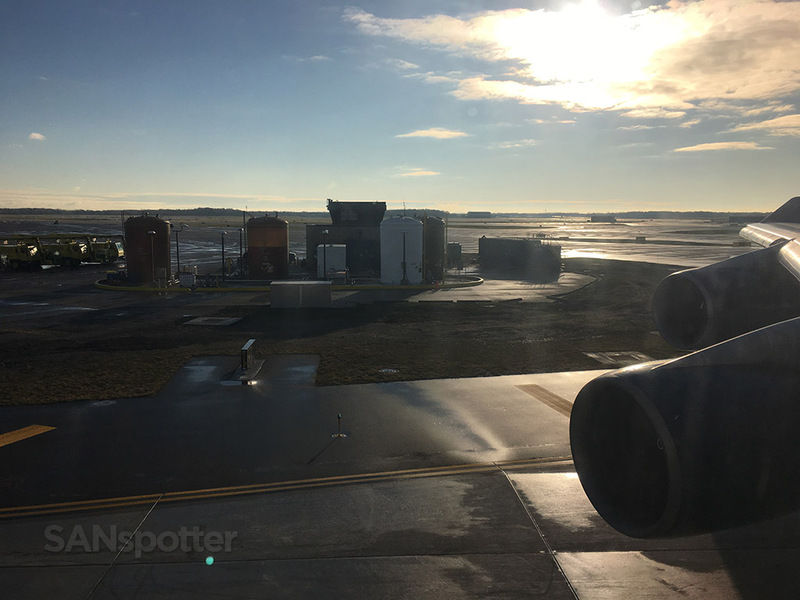 The captain made another announcement, this time saying that there was a “clearance issue” trying to maneuver around parked deicing equipment. 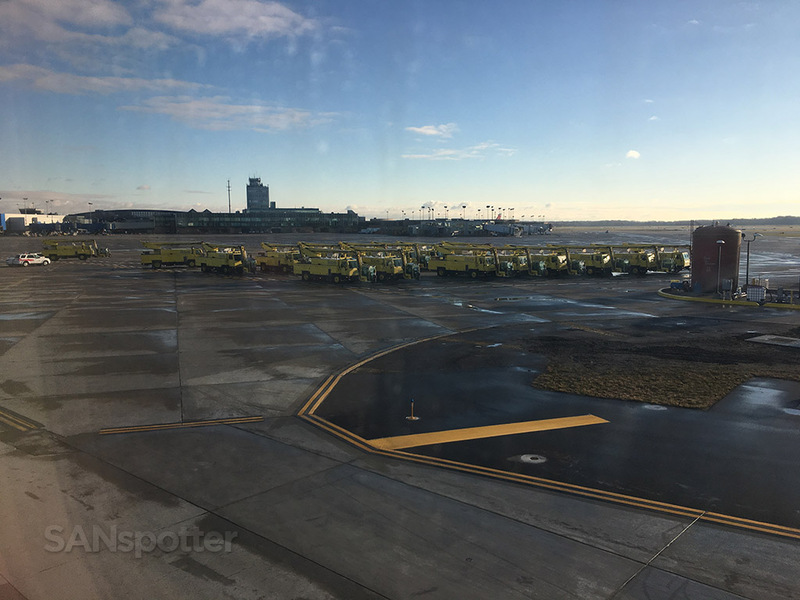 These parked deicing trucks were the culprit of our halt on the taxiway. Nothing to do but sit and wait some more. 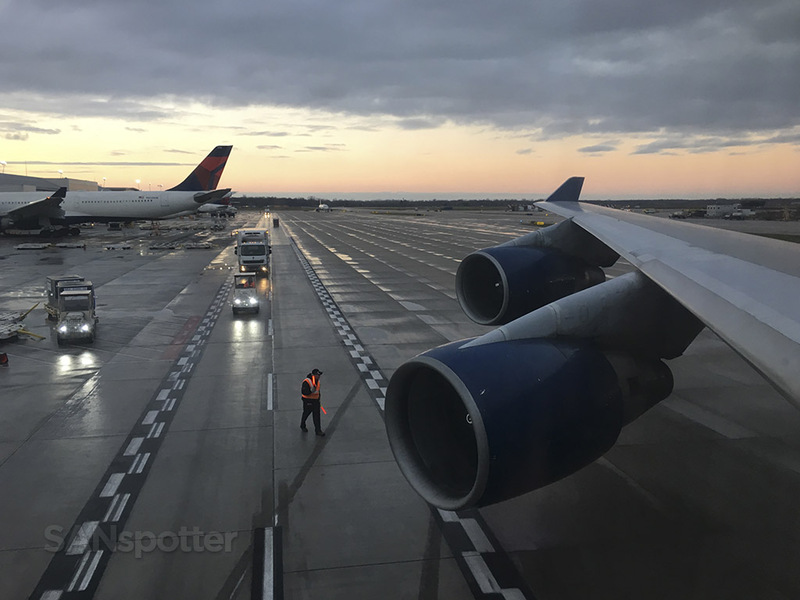 At first he said that we had to wait for the ground crew to come out and give us a tow around it, but 10 minutes went by and nothing happened. He then made an announcement that no tow was coming, but they were going to send out ops crew to determine if we could move forward without it. Long story short, we didn’t need the tow. 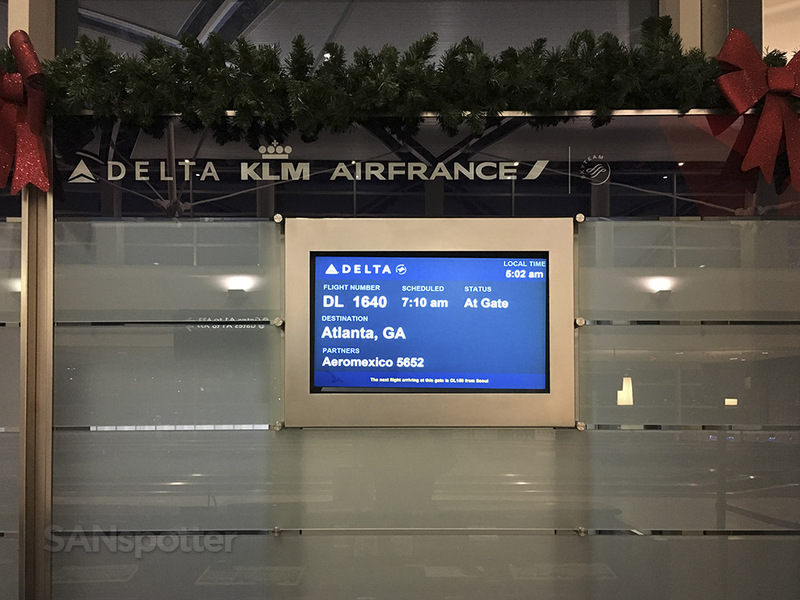 But we were now two hours behind schedule and the excitement of flying on a 747 from DTW to ATL had been greatly diminished. Long delays are never fun no matter what kind of aircraft it is! Finally rolling again! At this point I was just praying that nothing else would stop us on our way out of here. Two hours behind schedule, but here we go! Such a good feeling to be in the air and on the way to ATL. Our departure out of DTW was a bit odd, as we headed directly east for a while before making the turn south. Here we are crossing over the shores of Lake Erie. The clouds eventually made their appearance though, so there wasn’t much to see shortly after takeoff. Departing DTW never felt better, and it was so nice to finally be in the air and on the way to ATL. The in flight service began 15 minutes after departure, starting with the snack basket. Drink orders immediately followed. 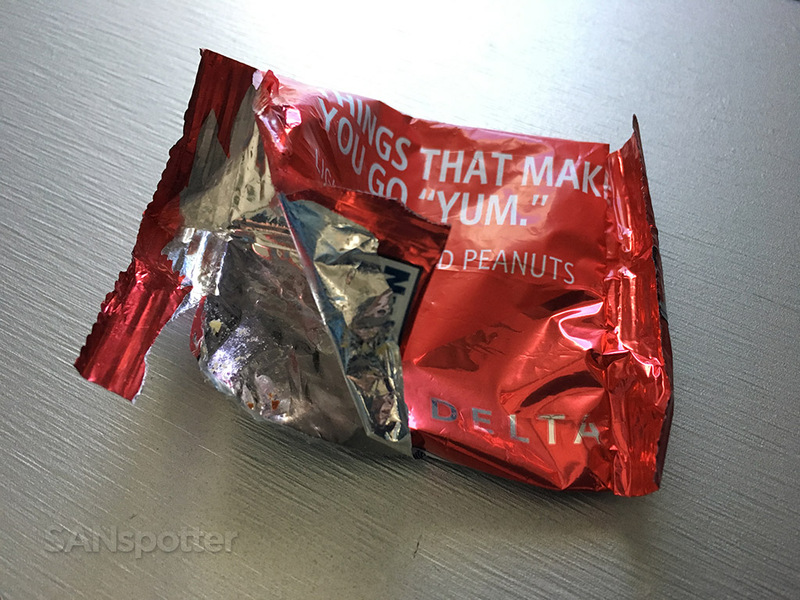 What’s left of my in flight snack. 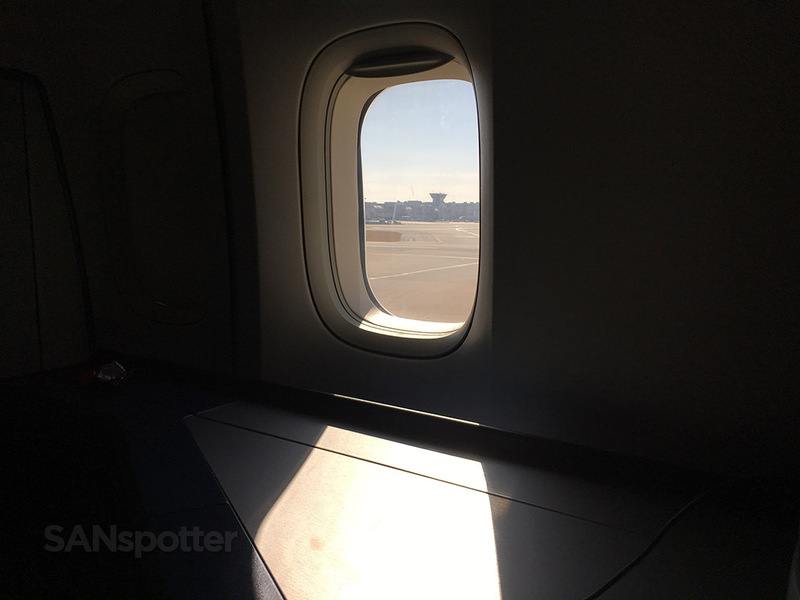 The service wasn’t anything out of the ordinary, most likely due to the short flight time. 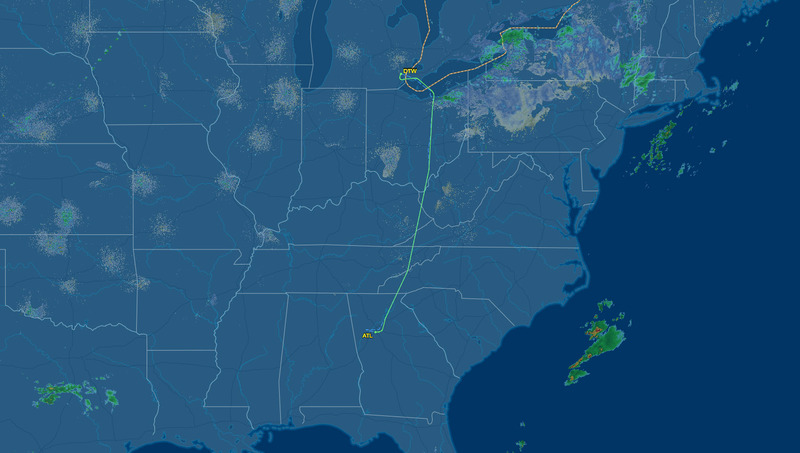 Quick pic of the moving map as we make our way south towards Atlanta. 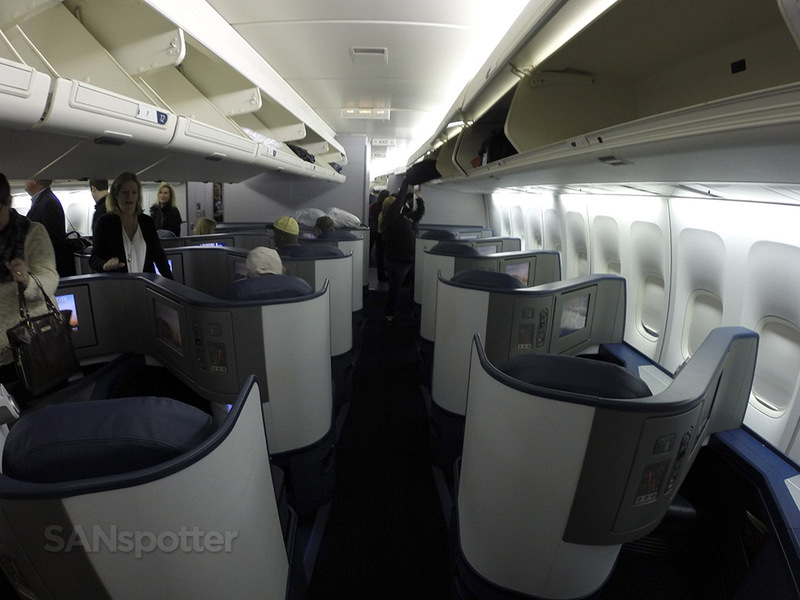 Delta Air Lines 747-400 forward galley. 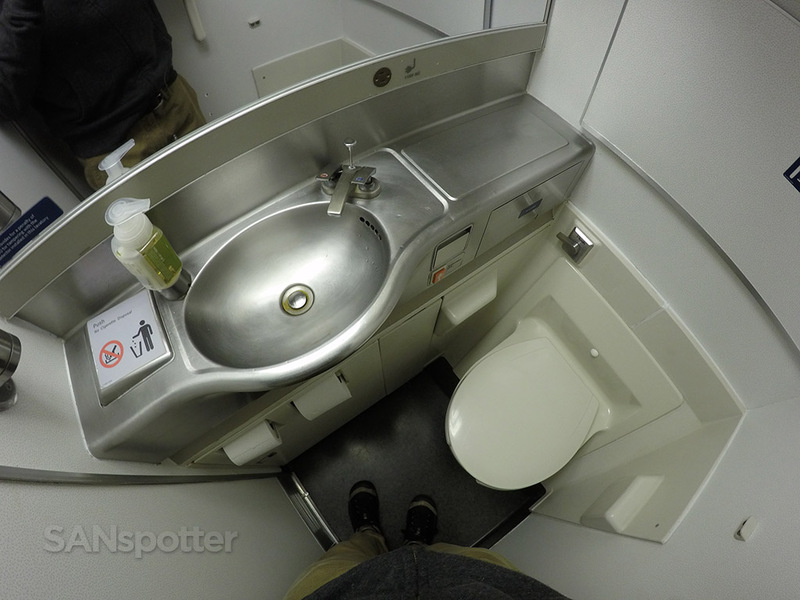 I didn’t really need to go, but the trip report wouldn’t be complete without a pic of the Delta One loo. 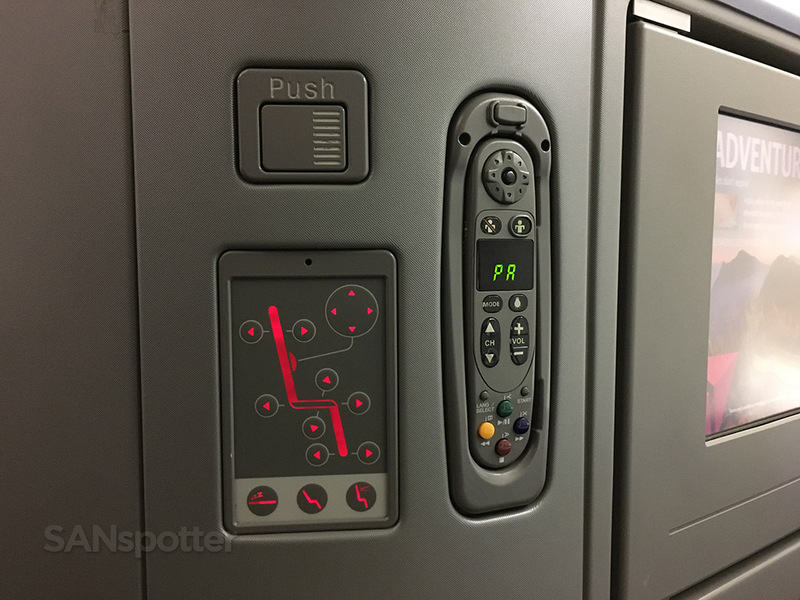 Detail shot of the overhead panel – just for the memories. 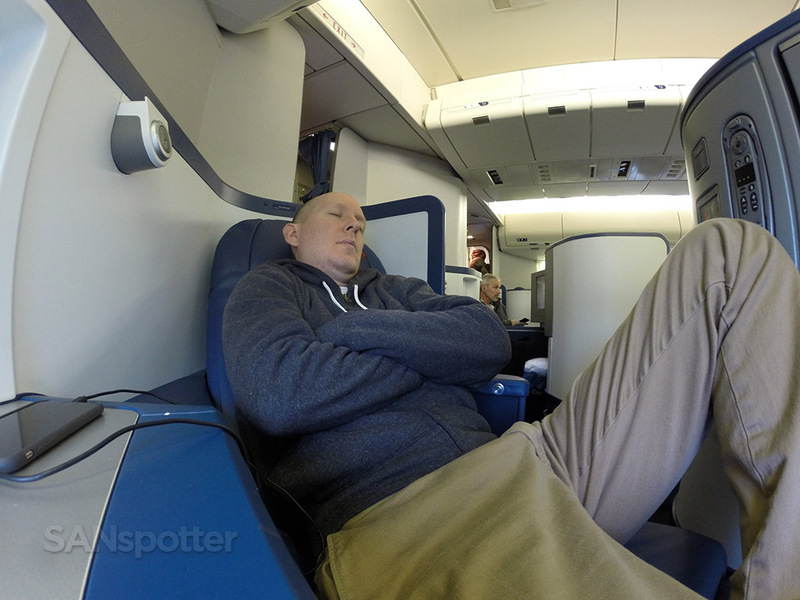 Overall, it was a pretty bland flight. Cold too. 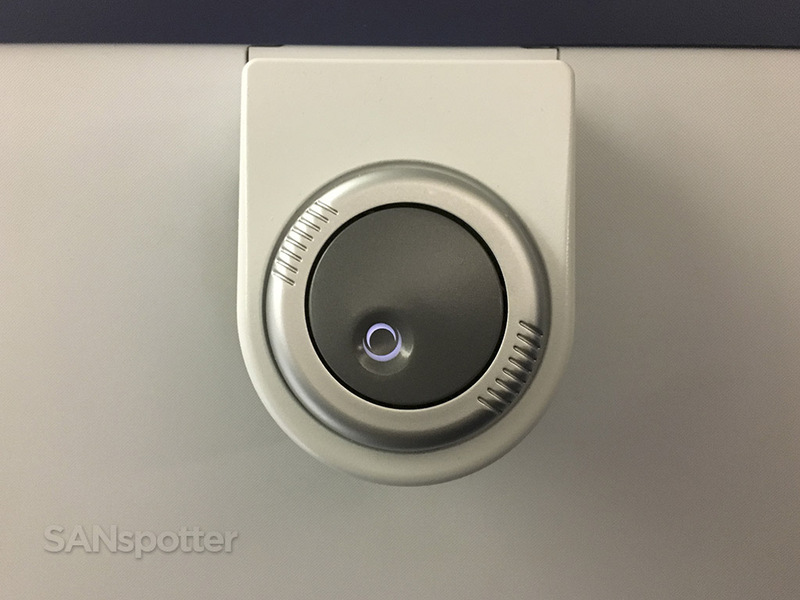 There was a serious draft coming from somewhere (I was never able to determine where the source was), but it was very cold and very annoying. 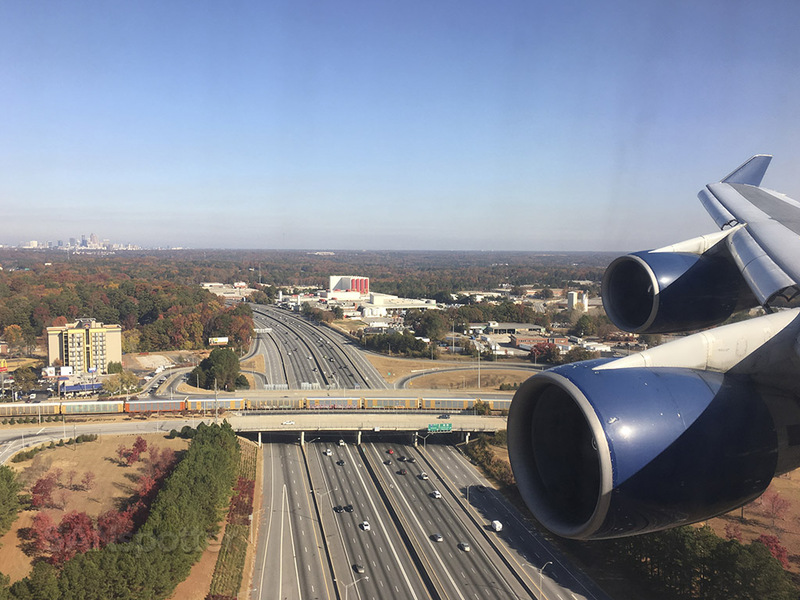 The good news is that the weather was perfect all the way down to Atlanta and it was a pretty smooth flight for the entire distance. 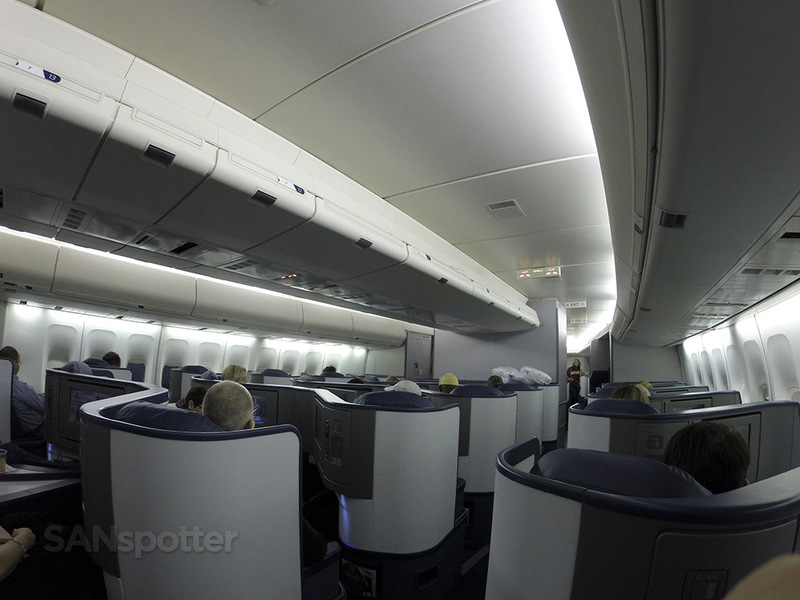 Delta One 747-400 cabin mid-flight. 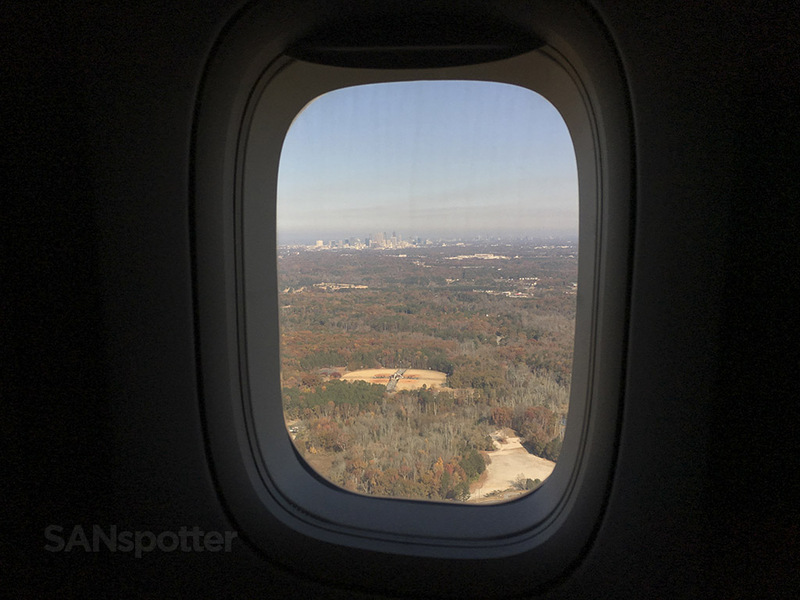 Starting the descent into ATL. 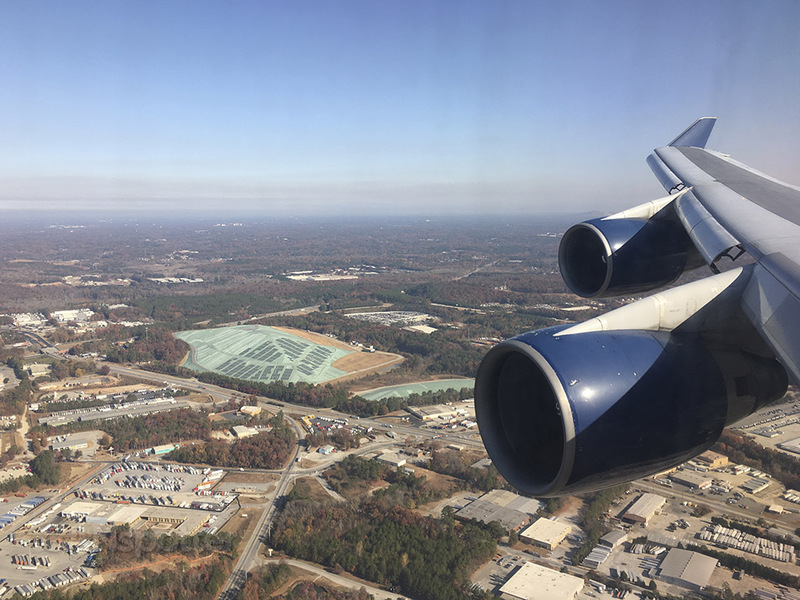 As many times as I’ve flown into and out of ATL, I’ve never seen these lakes. 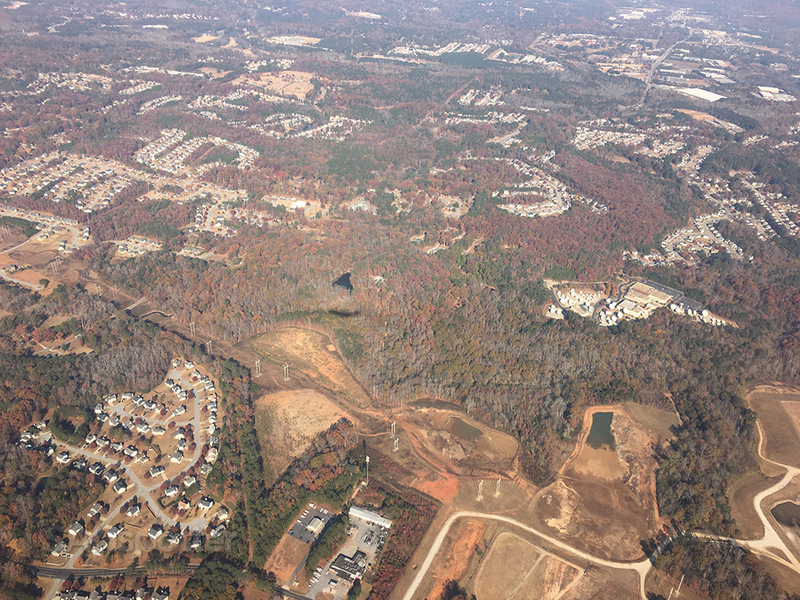 Suburbia surrounding the city of Atlanta. All lined up for a runway 26 arrival. The city of Atlanta off in the distance. 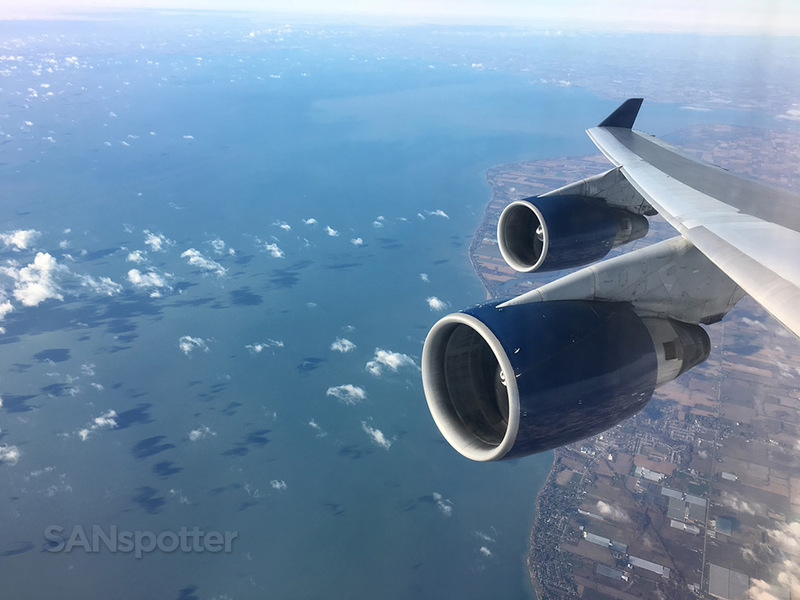 Those cars on the freeway below were lucky to get such a nice view of our 747! 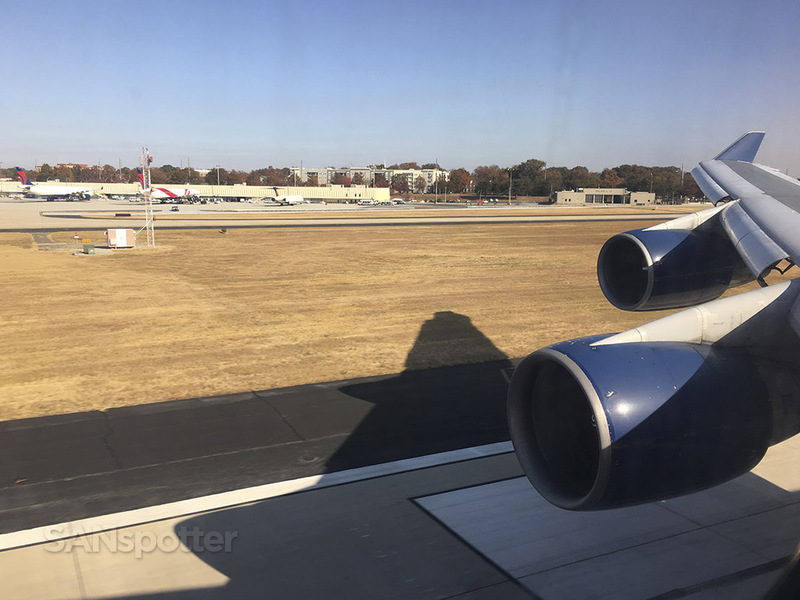 The 747 sure does cast large shadows! This flight was way too short, but at least I was looking forward to the 5 hour run to SEA coming up next. The familiar landscape of ATL. Pulling up to gate E28, with pallets of cargo ready to be loaded. Nice close up look at N662US parked here at E28. 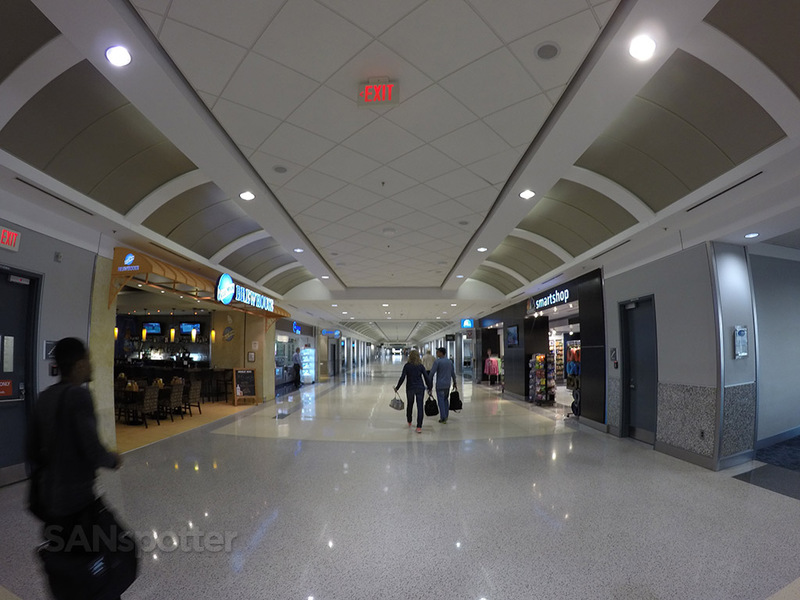 Looking straight down the E concourse here at ATL, killing time before the continuation of this 747 to SEA.